What a fabulous weekend and bank holiday. Not the days for sitting behind a computer. So, the reason for a delay in publish WB nr 10! 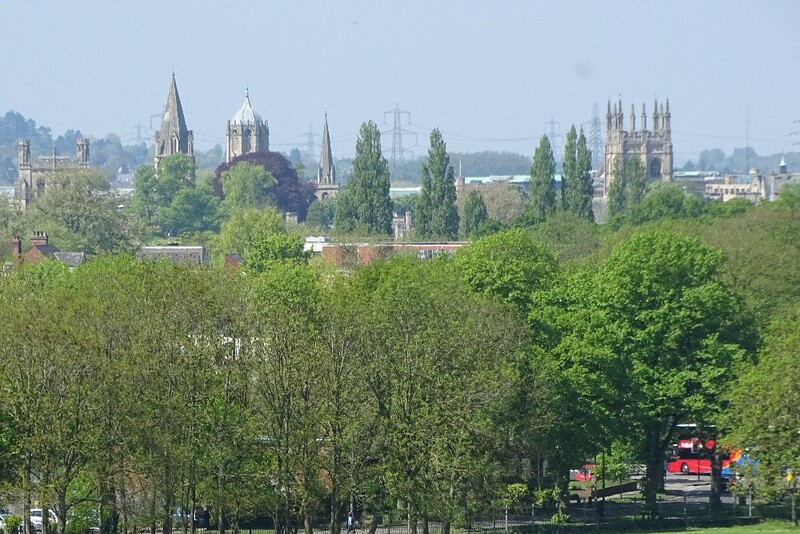 OXFORD - Dreaming Spires and an Oxford tube in this May morning photograph of our beautiful City caught in the lens of Richard Sharman on May 6th. This is a classic for Buses in the Landscape and one of the best so far. Ed. Quite a lot has been going on over the past week and I have a selection of excellent contributions. I very much appreciate the continued support and contributions from so many of you. The first an most important matter to highlight is the upcoming European Union’s new General Data Protection Regulation which comes into effect on May 25, and organisations will face stricter rules about how they store and use their contacts’ data. Hence I have written to all those readers whose email addresses are kept by me , which is then used to notify them about each issue as published. This does not apply to those who correspond by email as far as I can ascertain but one wants to be in line with the law. Please do advise me if your name was on the list and you wish to be notified when a page is published, stating that you do not object to my keepig your name on that list. Further regarding GDPR, I always send the mails to each person blind copy so that no one else can see your address. I trust all is clear but if you have any questions please let me know. 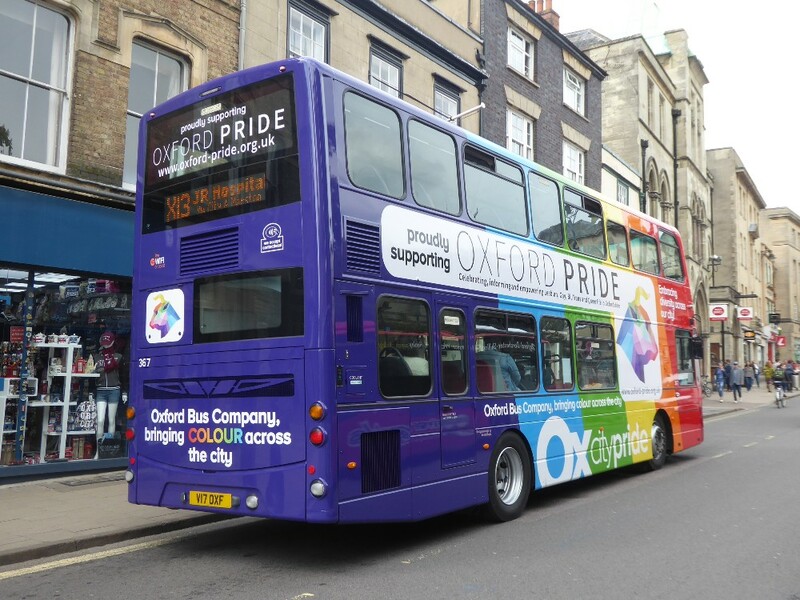 MORE monitoring of parking will take place on a main route into Oxford after complaints coaches are clogging up the street. 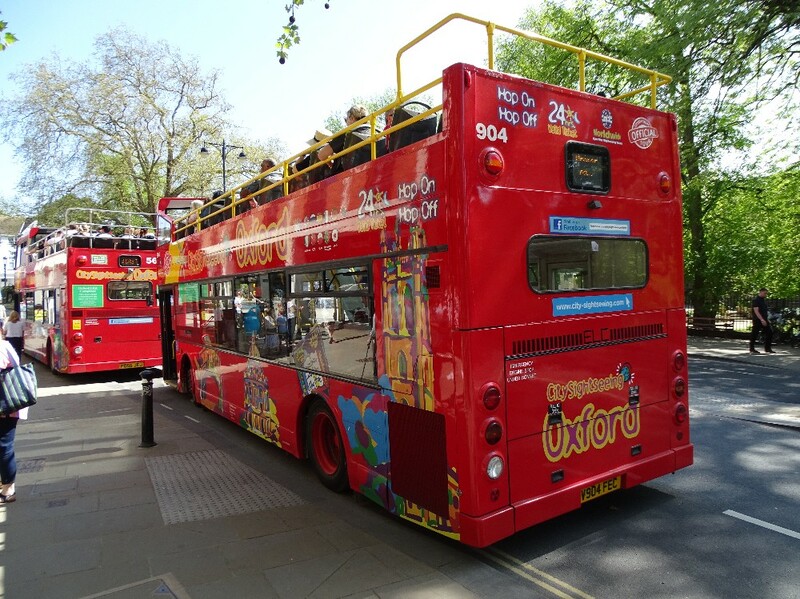 Oxford City Councillor Mary Clarkson have taken a proof photo of coaches blocking a cycle lane on St Giles on Easter Sunday, with cyclists forced to pedal around them. She urged authorities to 'take Oxford’s cycling city status seriously' ahead of a busy summer for the city. The County Council said its officers had visited the street several times on Sunday – but that no tickets were issued. 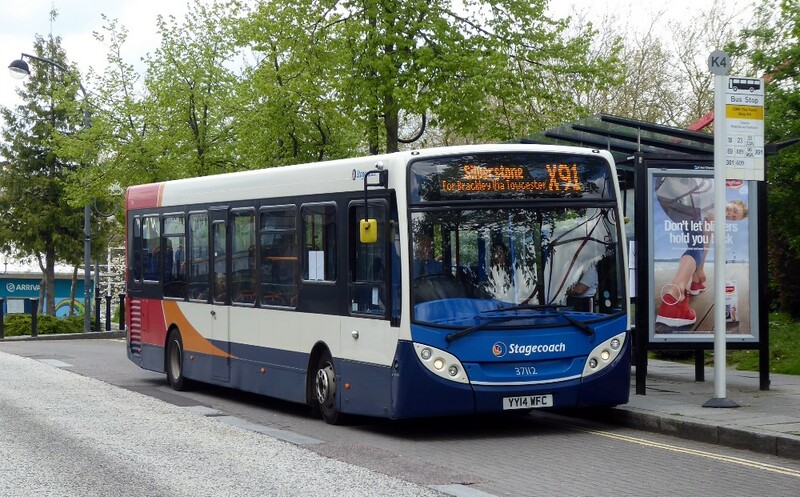 It said although its parking attendants had spotted some coach drivers parking on double yellow lines, they were allowed to do so because passengers were simply getting on or off the coaches. The council also allows drivers what it said was a ‘period of observation’ before issuing a ticket. It said drivers ‘often move on’ during that time. 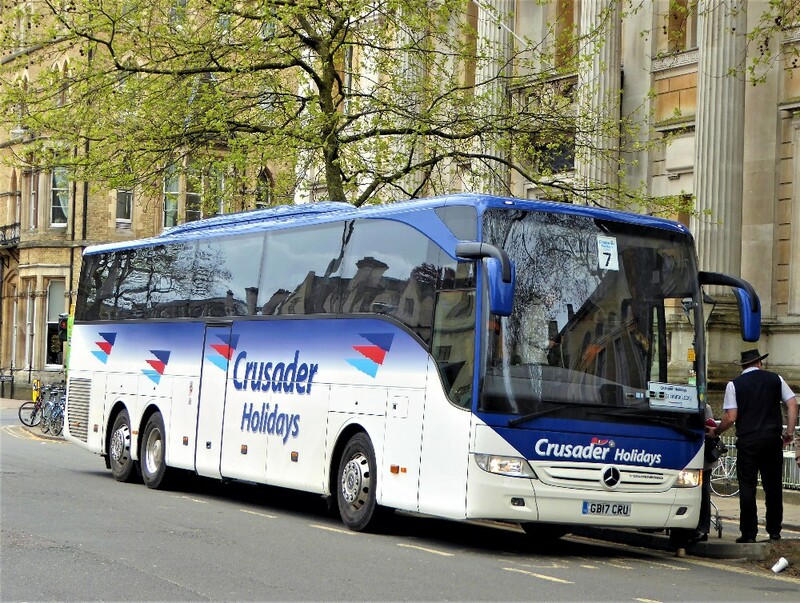 Motts - Crusader Mercedes Tourismo GB17CRU unloads in St Giles on April 30th by David Beynon. This is one of the location where congestion is often caused but not on this occasion! Whilst not wishing to detract from the Council's work I do have to note that Oxford seems to fail to acknowledge to importance of proper public transport facilities, with extensive on street bus stops (also causing traffic congestion), the lack of a modern and workable coach station and a proper area for visiting coaches to drop off and pick up their passengers. It is really poor for a city which attracts many visitors throughout the year. 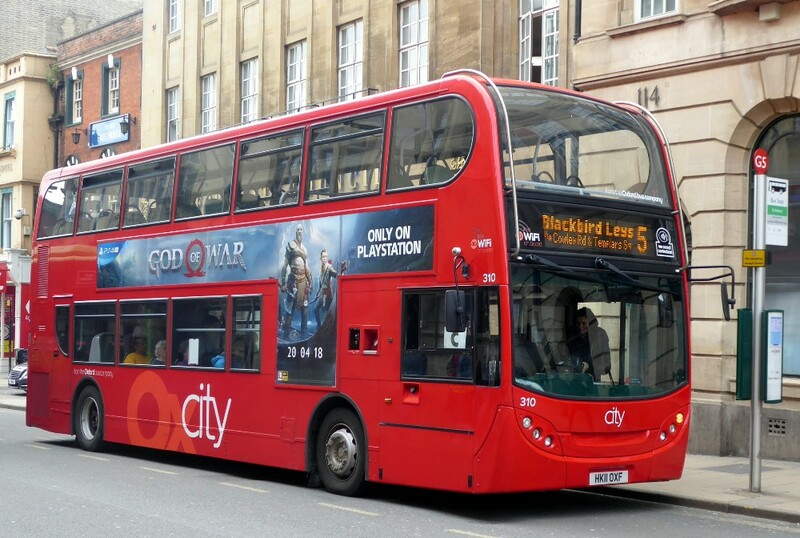 Another area is the High Street where extensive congestion is caused by loading buses. Seems this may be about to change? Graham Low writes "This notice has just appeared on stop T1 at Turl St/High St junction were the pavement was widened last autumn because more routes and therefore more people use it. 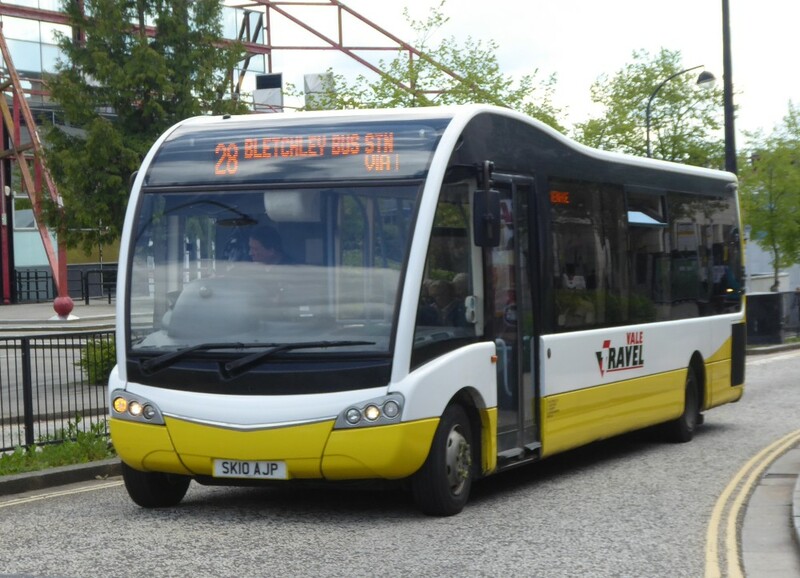 But, the road is now too narrow to allow traffic to pass between buses facing eastbound at the stop and traffic, which is often forced to queue going westbound towards Carfax. I hope that this sign is about remodelling the pavement/road arrangements, which have been so much criticised in the press as well as by bus operators and drivers. Arriva 280 buses often spend several minutes at the stop not just picking up passengers but making up time, adding to the frequent chaos." 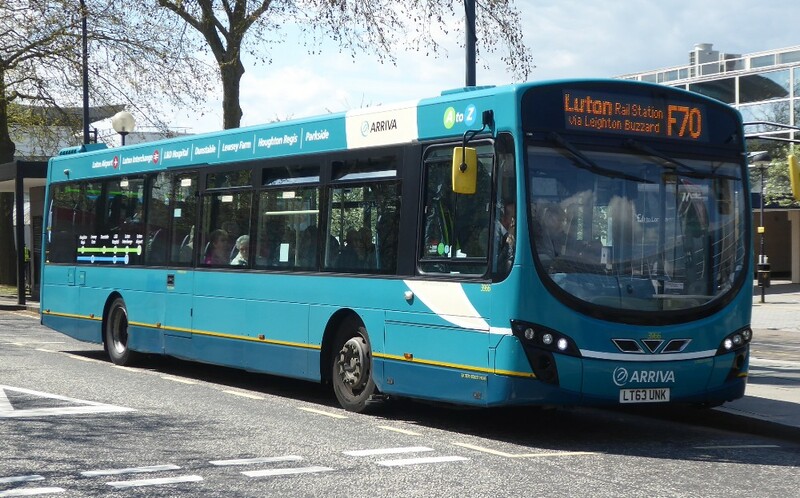 School children across Buckinghamshire struggled to get home on Friday afternoon, April 27th, after police announced a surprise inspection of private bus operators. 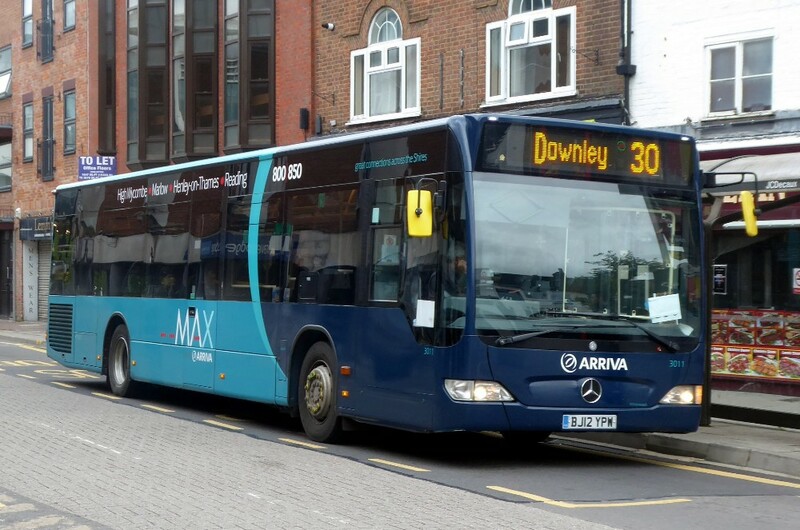 Bucks County Council (BCC) posted on Twitter, the following Monday, warning parents and pupils there may still be some disruption to Bucks School Transport Service, due to an unplanned inspection by police and the Government body - The Driver and Vehicle Standards Agency (DVSA). 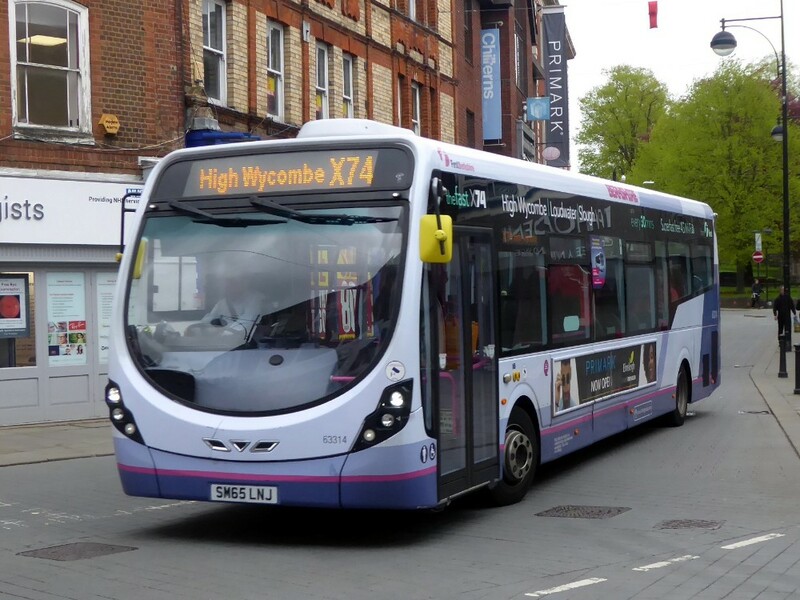 Services in High Wycombe, provided by Neale's Taxis Ltd, Heyfordian Travel Ltd and Cliffs Coaches Ltd, were all disrupted as a result of the inspection. However it is not yet clear which operators were targeted during the inspection. Marlow’s Sir William Borlase’s Grammar School, Great Marlow School, The Royal Grammar School in High Wycombe and Beaconsfield High School were among the schools affected. 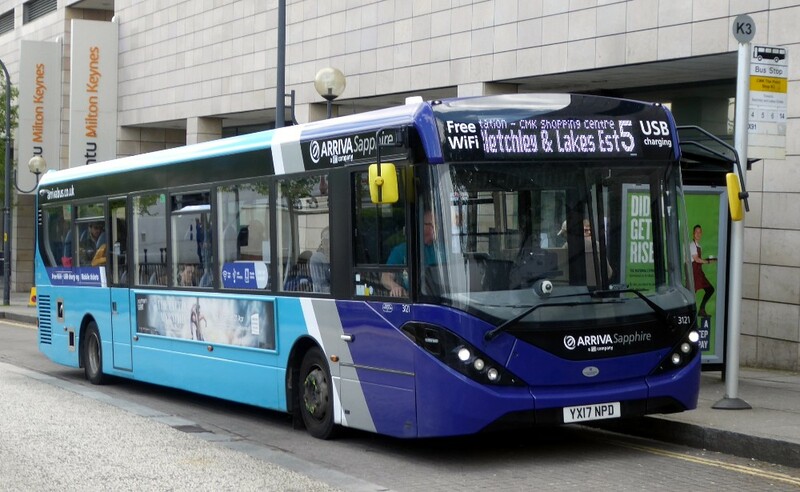 Council teams worked throughout the weekend in a bid to restore the services to normal – and buses appeared to be running on time on the following Monday morning. 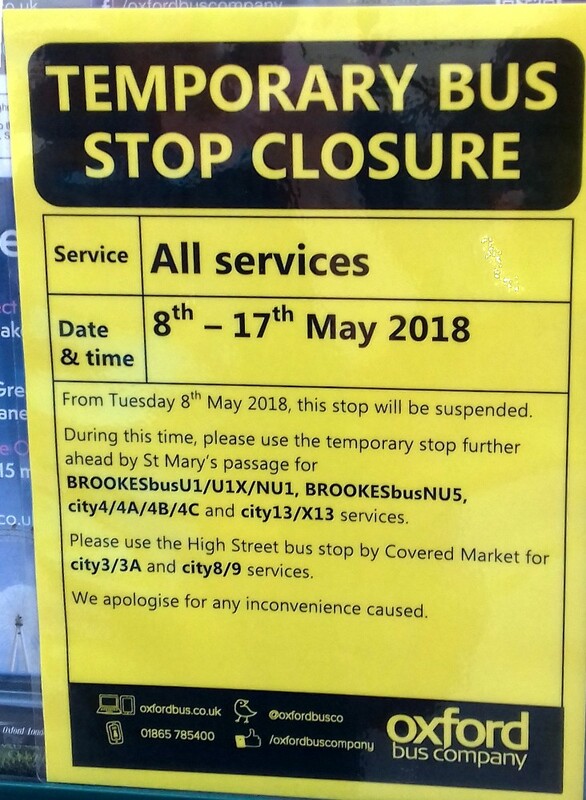 On the afternoon of April 30th, BCC confirmed school buses were delayed on Friday due to a police operation in the area - which prevented the vehicles from leaving the depot. 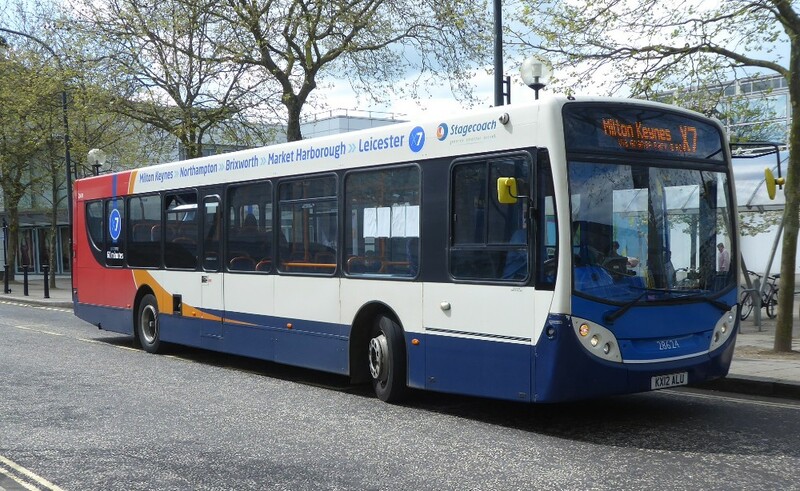 Spokesman for BCC, Alison Donovan, said: "Our School Transport Services experienced some disruption on Friday (27 April) afternoon. This was due to what we now understand to be a police operation in the area that delayed some vehicles from leaving the depot. At this stage we do not have any more information, but we are seeking further clarification from both Thames Valley Police and DVSA". 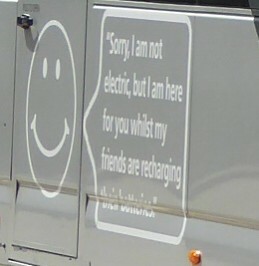 I know that readers may well be only bus/coach enthusiasts but I liked the following which I am sharing with you. Frank visited this rather lovely location a week ago or so and sent this following report. "The attached were noted on rail replacement duties earlier today covering rail services from Oxford." Pictures were taken on April 29th by David Beynon. Harry Shaw's YN15ELX and YR16BLF at Oxford Station. Making a fine display with creditable destination displays, Reading's 420 and 415 at Oxford Station. Tappins BL64MFK also Oxford Station. Gavin visited Milton Keynes on May 1st and provided numerous pictures, of which I have chosen those I believe will be of most interest to readers. 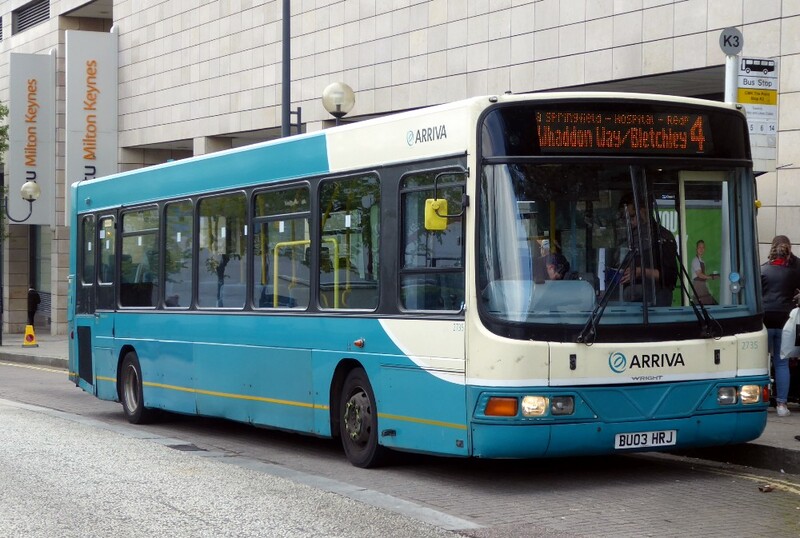 There are, as you will see, some diverse situations with the very newest Arriva livery and the oldest within the space of a few minutes. 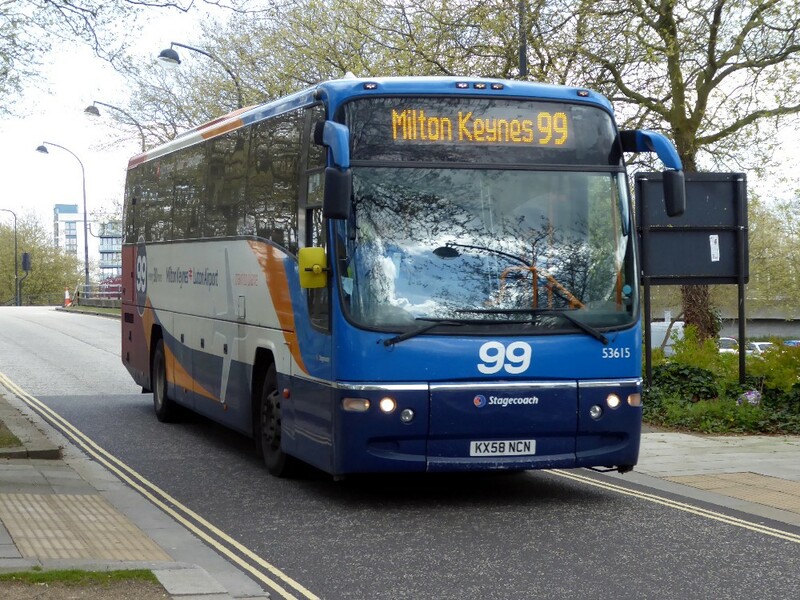 One also wonders if the 99 route of Stagecoach between MK Rail and Luton Airport is a route really suitable for an E200 local bus? Also maybe luggage is no longer a problem and seat belts are not mandatory ! Finally there are quite a number of smaller operators serving this area as the photos will show. 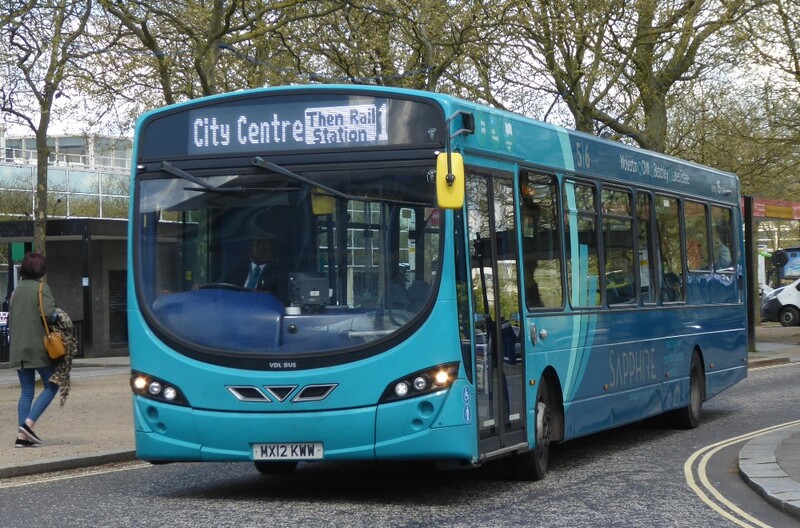 Seemingly on loan to Arriva, 0449 HRZ6499 is seen working route 7. 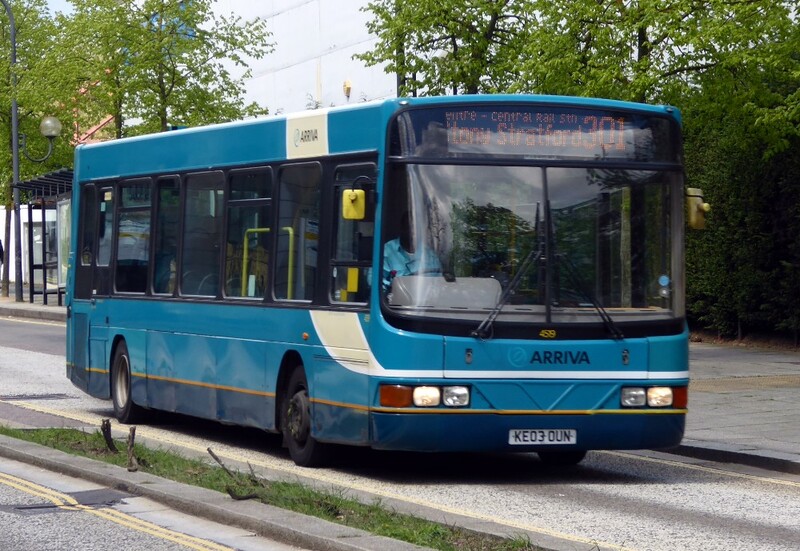 Surely an old timer now, dating from 2003, some 15 years old - Arriva 2735 working route 4. 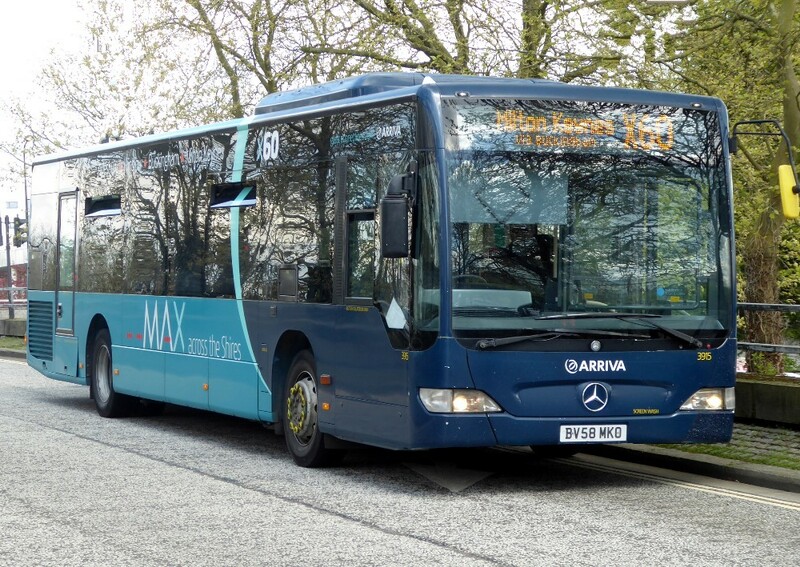 The black Arriva name is interesting. 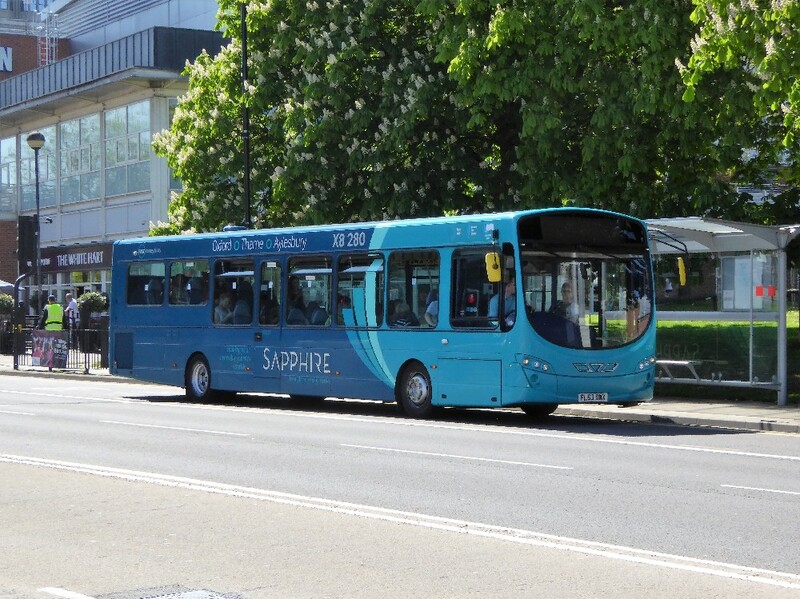 I wonder what acknowledgement to Sapphire service these buses have, with 3121 and 3125 working route 5. Long time servant as MK is Arriva 3621 working the 300. 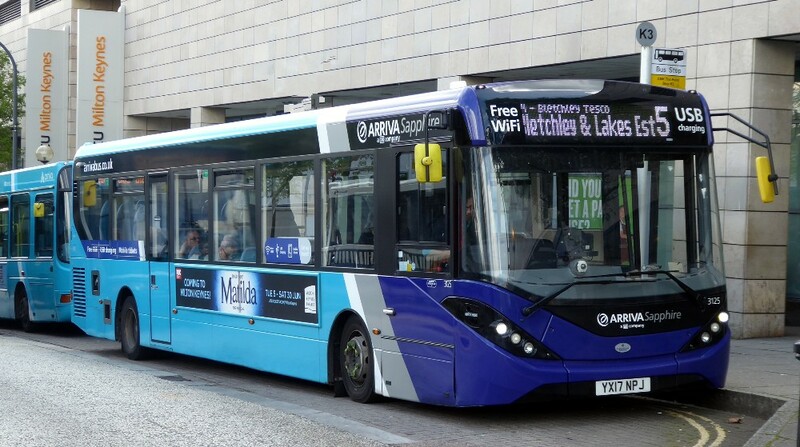 This bus was, I believe, new to MK Metro and now resplendent in the latest livery. 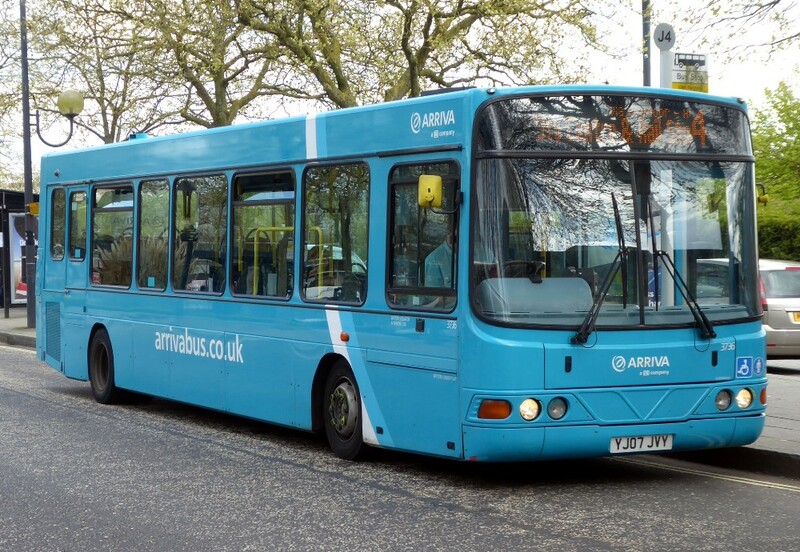 Another older bus now in the new livery is Arriva 3736 working route 4. An interesting destination display on Arriva 3768 MX12KWW working the 1 and 3771 MX12KXA, both of which came from Arriva North West. 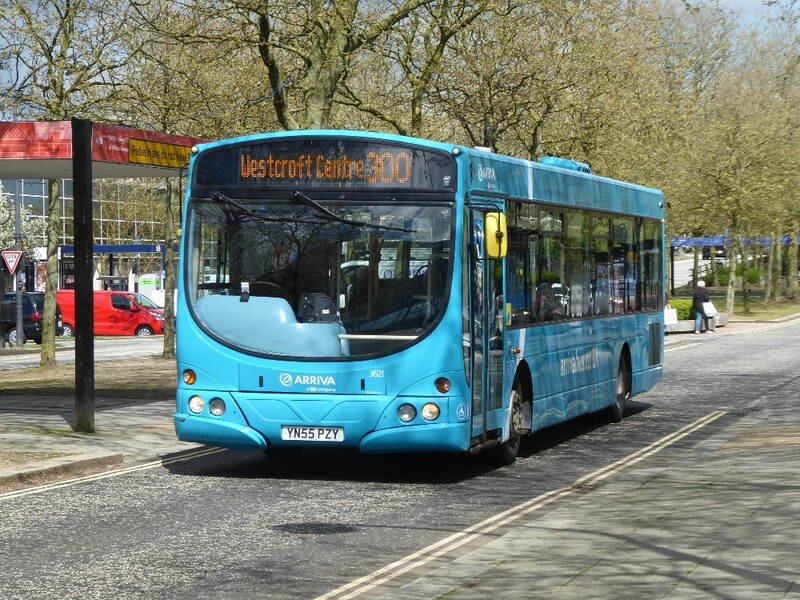 Not so many Citaros are seen in this location - Arriva 3915 on the X60 from Aylesbury. 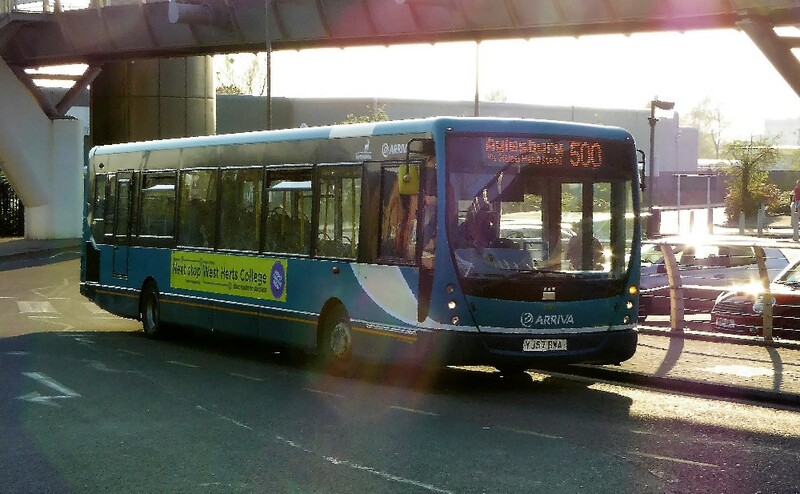 Seems this bus maybe away from its branded track - Arriva 3966 on an F70 working. 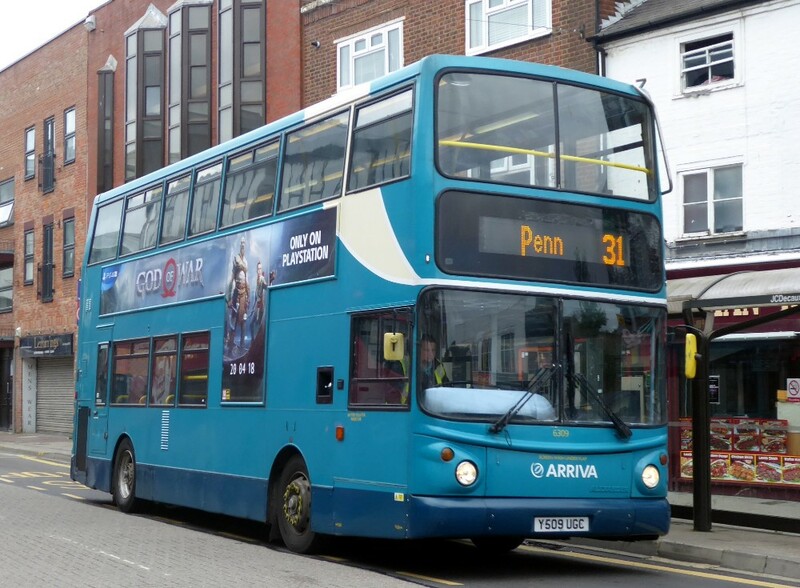 Another older bus - Arriva 4519 on route 301. 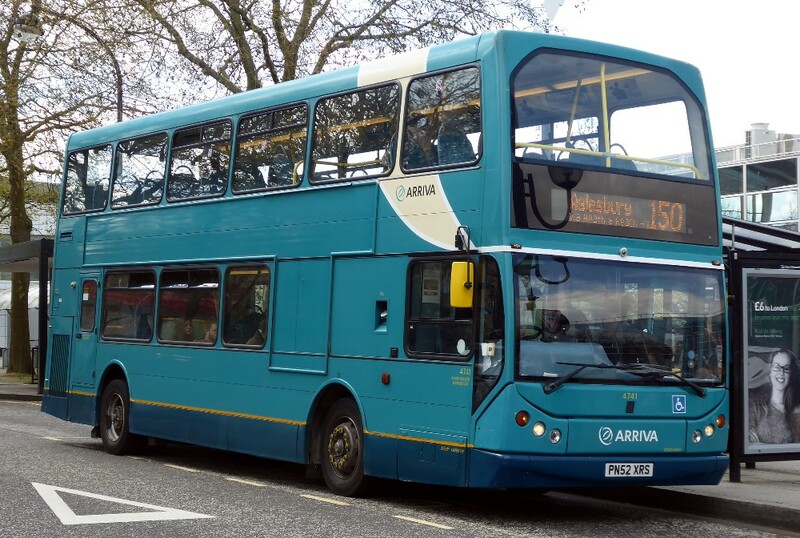 I think this must have been new to Leicester but Arriva 4741 is now at Aylesbury and working the 150. 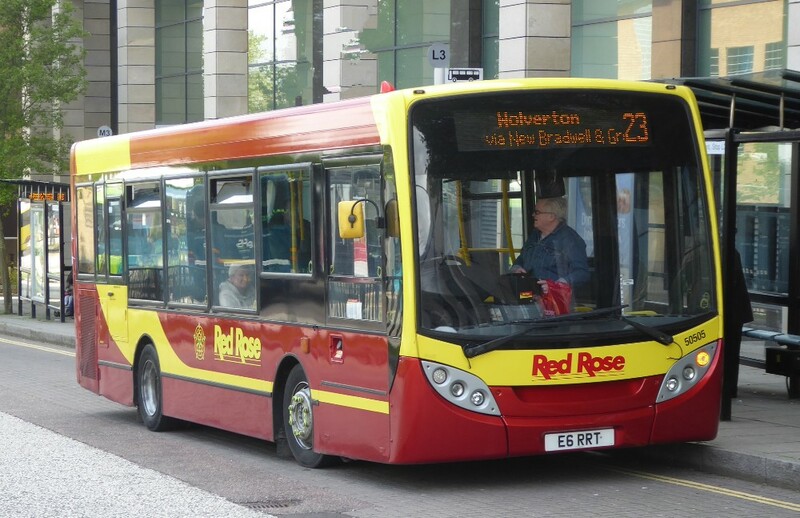 Red Rose are now seen on a number of local workings and here 50505 E6RRT is seen with a 23 service. Once with Tower Transit as DM44265, Red Rose's YX61FZH works the 33. 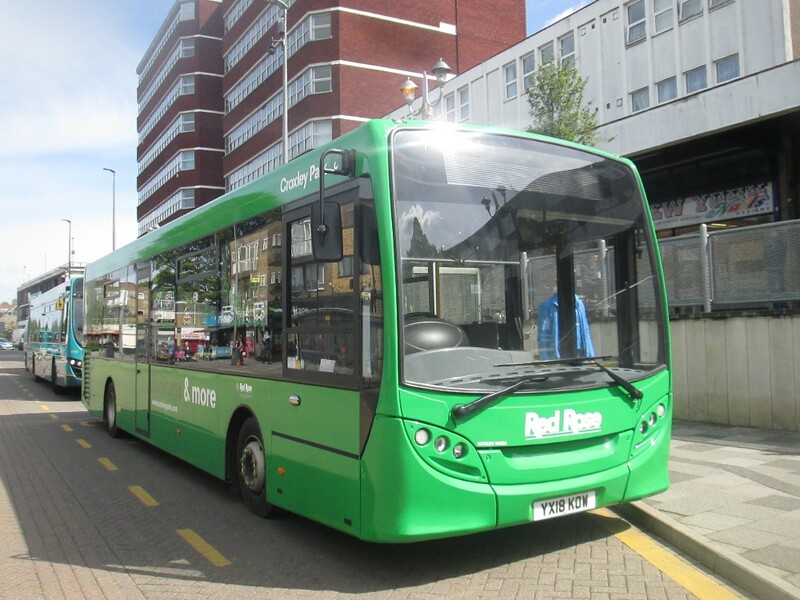 Redline is another Aylesbury based operator and their YX64VRF is working the 21 Gold service. It does look smart! 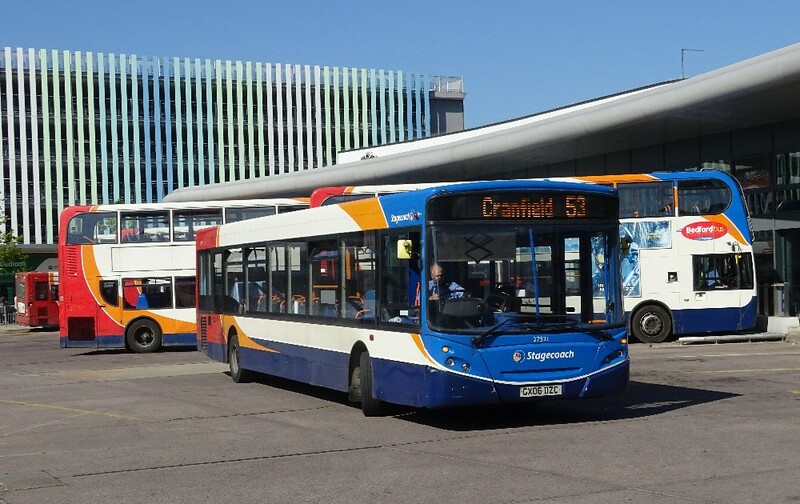 Stagecoach have a presence and here from East, 36937 is on the 99 to Luton Airport. East's 53615 is branded for the 99 though this coach was once a rostered performer on the X5 from Cambridge to Oxford! The rear looks somewhat careworn don't you think? 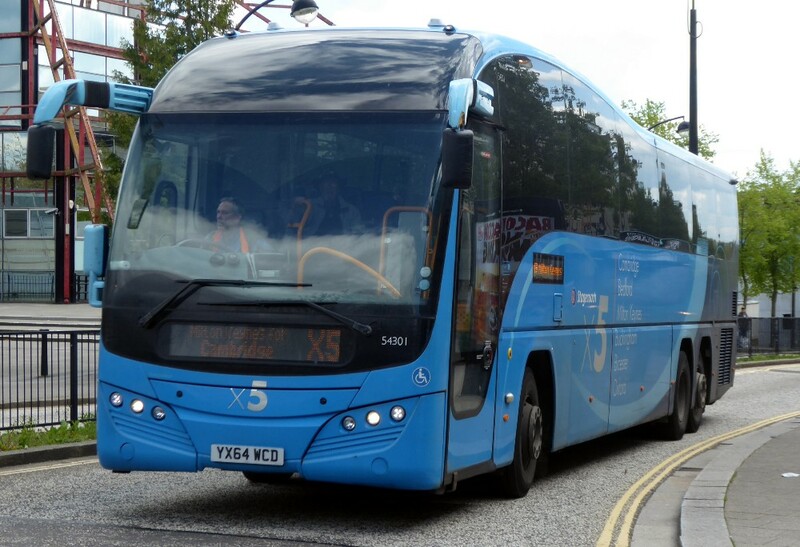 Current coaches on the X5 are a fleet of tri-axles delivered in 2014-15. Here flagship 54301 is on its way to Cambridge. 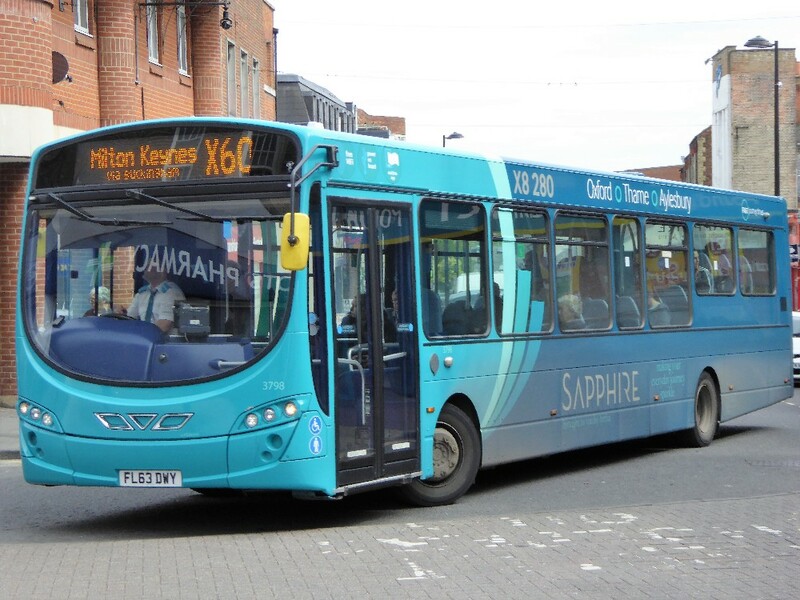 The X4 is to be cut back to Northampton as mentioned in the last issue. 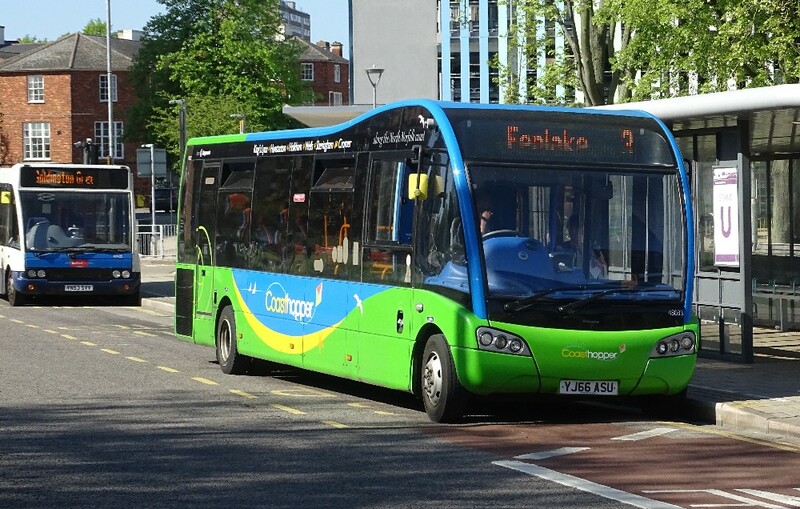 Here Midlands 15751 KX61DLZ shows in detail the branding on these buses. 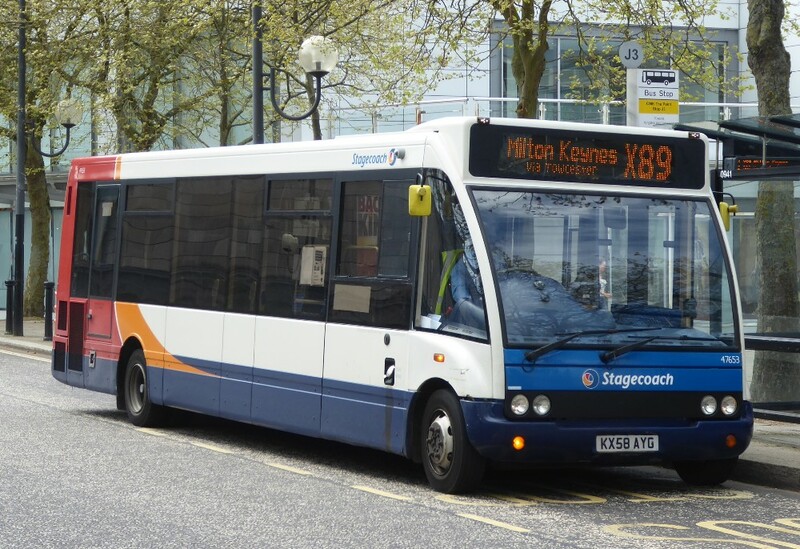 One long distance Stagecoach service to MK is the X7 from Leicester here worked by Midlands 28624. 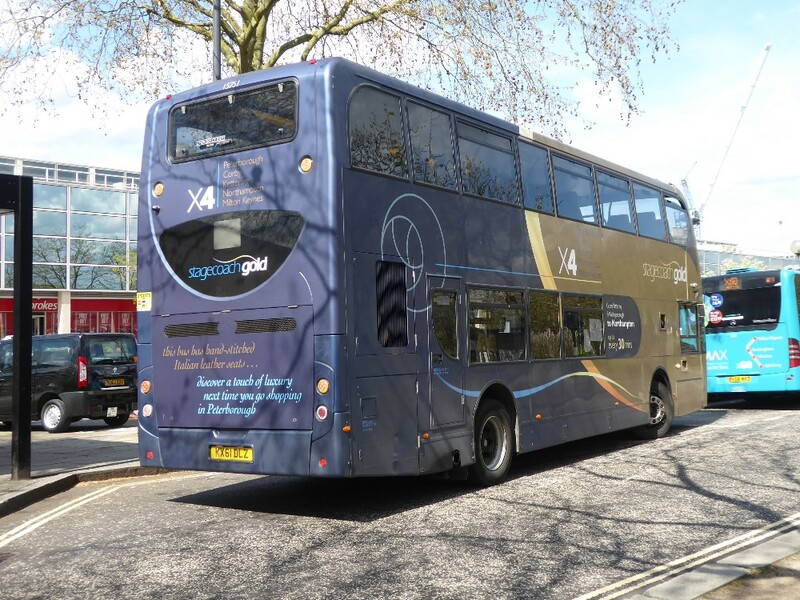 A Solo on an express service - Midlands 47653 KX58AYG is working the X89. An E200 works another express service, this time the X91 which passes Silverstone of F1 fame! Vale Travel work a number of services from MK as seen in the three pictures above. Solo SR SK10AJP works a 28 along with ex London General Y844TGH (LDP class) and YX09FLF works the 11. Last but not least, Z&S work the 18 and MX11CZK is seen on this duty. The bus is rather smartly turned out. Gary took a nice variety of Stagecoach buses in Bedford showing some of the strange brandings of buses a long way from home! 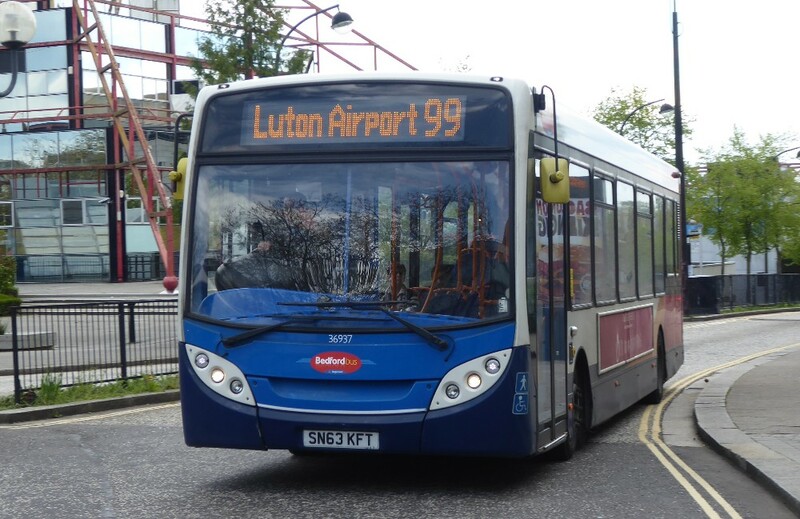 Gary writes "The latest from Bedford with the place flooded with ex Kings Lynn saloons, Solo's, E200MMC's and E300's, plenty in Coasthopper livery, most in service to such coastal places as Luton and Northampton ! I'll advise a full list when known. I did a quick trip to Bedford on Saturday afternoon and saw an ex Peterborough E400 broken down at 14.15 on the 42 to Flitwick, with Grant Palmer rescuing the passengers ! Then at 17.15 noted an X5 on suspended tow back into town from the south! 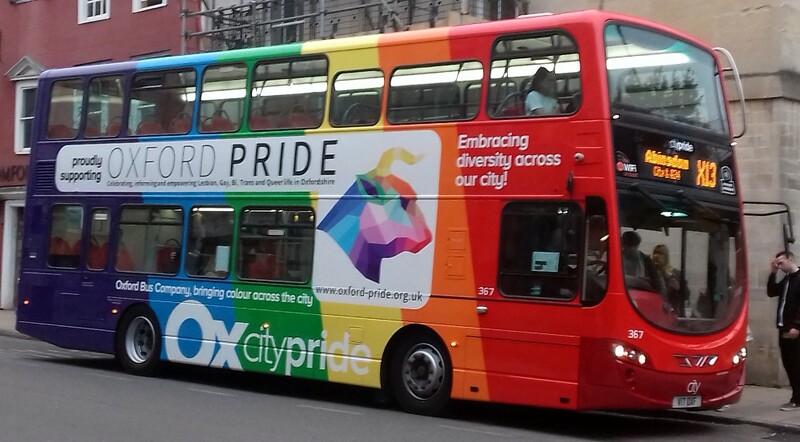 Then the 16.00 Oxford X5 left almost 25 minutes down! It was suggested that all M A N's were to be stood down but one was on Towns - 22316, plus reserve 18057 ! plus four ex Eastbourne ones, 27520-3. So the pictures below tell the tale." 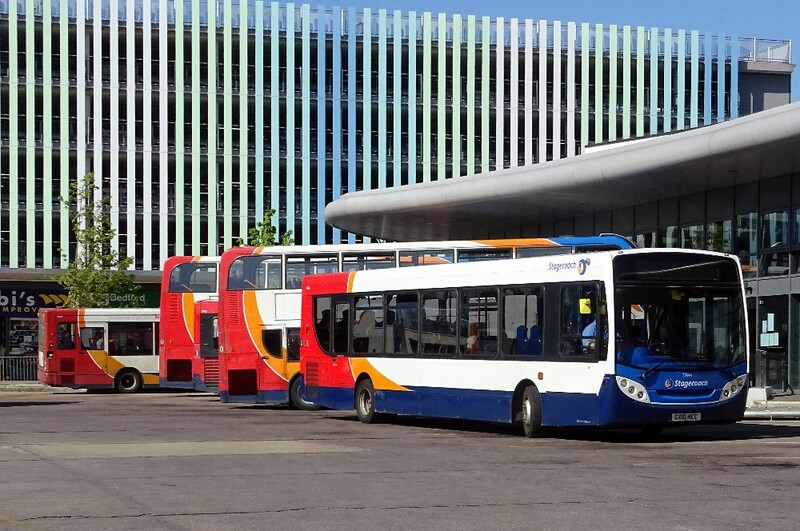 Ex Eastbourne, a long way from home, 27521 GX06DZC and 27522 GX06DZD are both seen in Bedford Bus Station on May 5th by Gary Seamarks. 27646 GX10HCC seen in Bedford Bus Station on May 5th by Gary Seamarks. 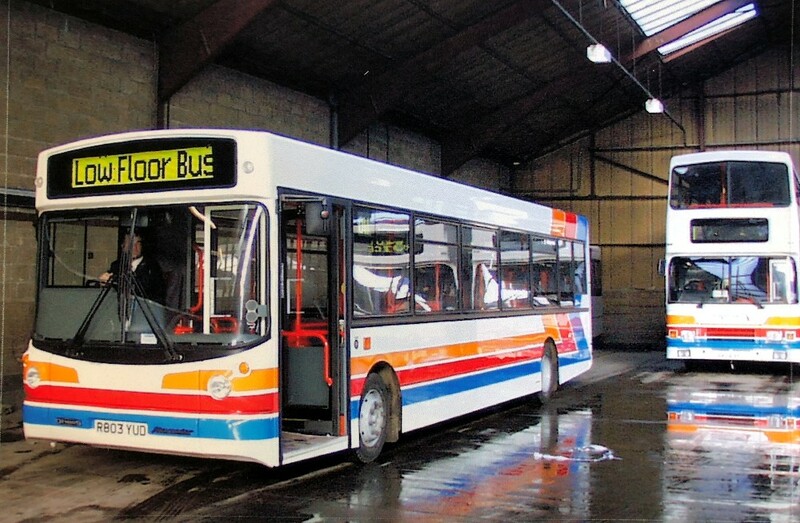 This bus once carried full branding for the 700 Brighton service!!! Solo 48024 YJ15ANU works a number 7 service in Bedford on May 5th by Gary Seamarks. The fleet number must have been applied in the dark!!!!! Solo 48033 YJ66ASU and 37437 SN16ORG on the way from Kings Lynn to Cromer via Bedford or ???? 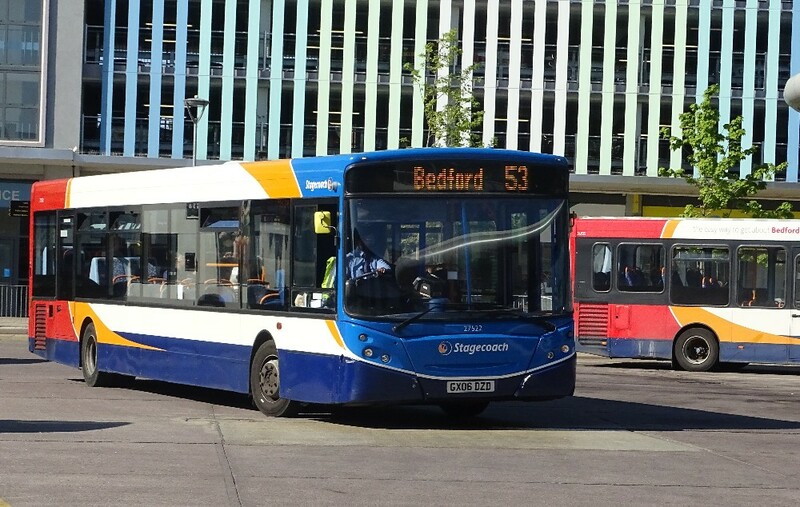 both seen in Bedford Bus Station on May 5th by Gary Seamarks. 27520-23 On loan from Eastbourne, 27642-47 and 37431-37-38-39 (Coast Hopper) plus Solos 48021-25-31-32-35-36 in Coast Hopper livery from Norfolk. Things seem little bizarre to say the least. 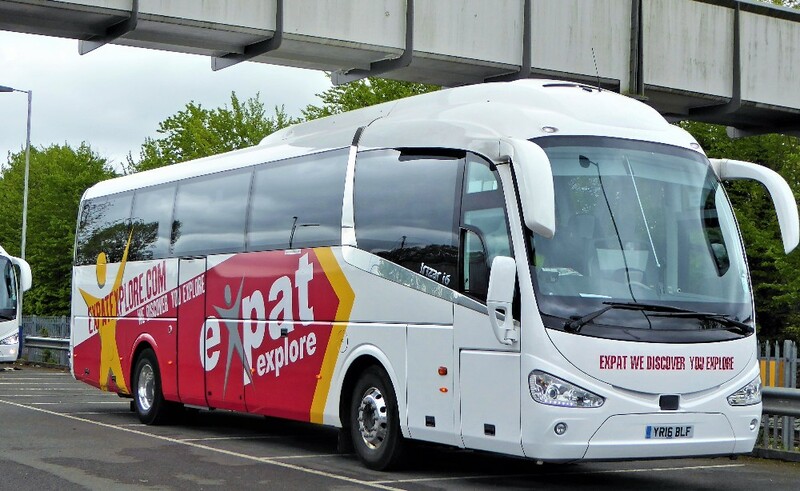 "Before I left Auckland, I was doing some part time driving for the Howick and Eastern Bus Company, which is owned by Brian Souter's personal investment company. I've attached a picture of my steed for one of the shifts taken at the Panmure bus/rail interchange in East Auckland. 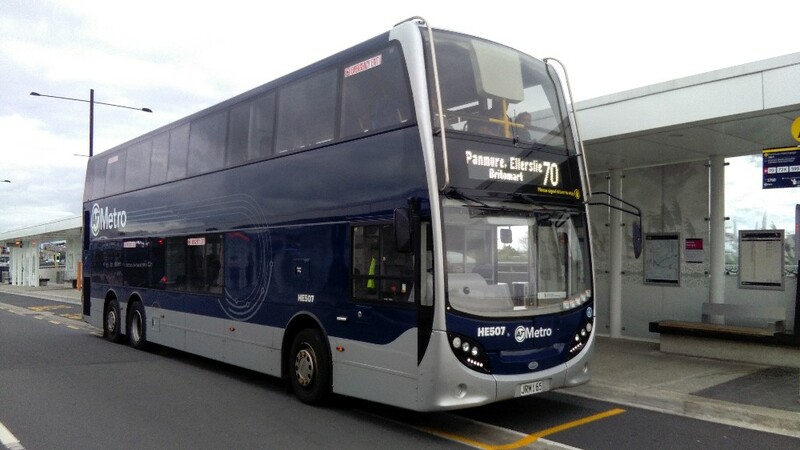 I have to say that the NZ spec ADL Enviro 500 is a very impressive beast. With two doors, 91 high-back Lazzerini seats and full Aircon, they certainly eat up the bus queues and carry people in decent comfort. Restrictive axle weight limits in NZ highway law mean that deckers need to be tri-axle to comply and this is the happy result! 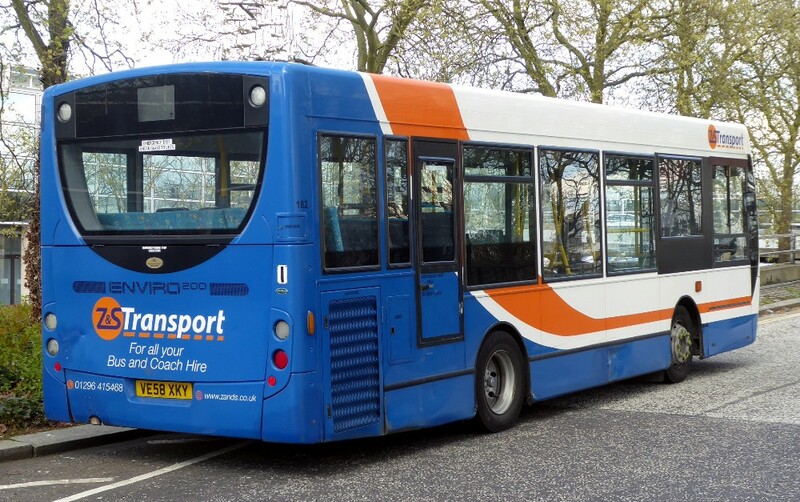 So I'm still driving blue buses, but they're rather different to the ones I drove after I passed my PSV test at Charlton-on-Otmoor in the 70s!!" Metro - Howick and Eastern Bus Co - Auckland NZ - HE507 JRM165 r 70 Panmure taken on April 23rd by Andrew Dyer. Charlton-on-Otmoor ex London RT KGU239 loads in Gloucester Green around the 1970s by Andrew Dyer. Very many thanks for this most interesting piece by Andrew. I am including some pictures I took years ago which I hope will bring back memories for those old enough to remember. London country North West TPL92 B292KPF pauses at Stokenchurch with a 291 service from London on November 17th 1989. 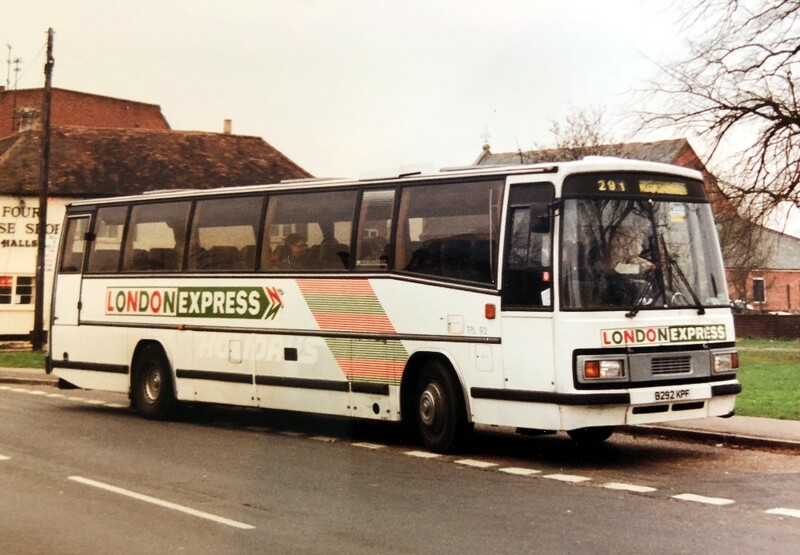 The LONDON EXPRESS branding was interesting and a variation for National Express. 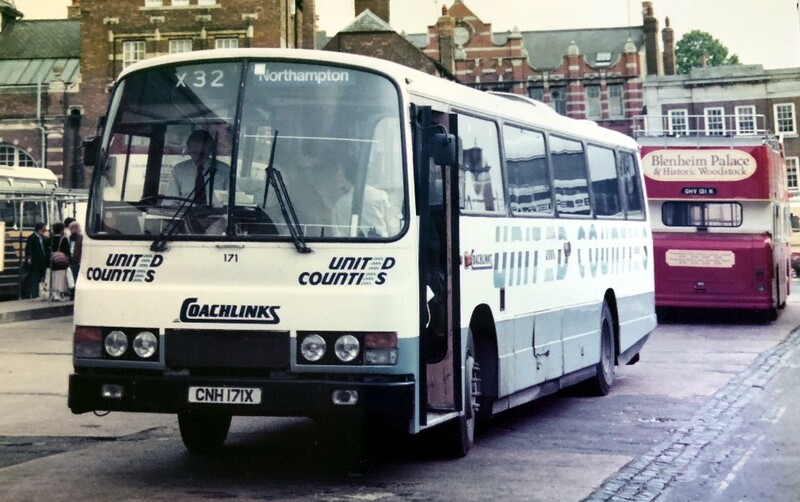 Bet many of you didn't know that you could travel to Northampton from Oxford on a United Counties Coachlinks service. UCOC 171 CNH171X on the X32 at Gloucester Green in the 1980's. And now some Thames Transit and early Stagecoach pictures. 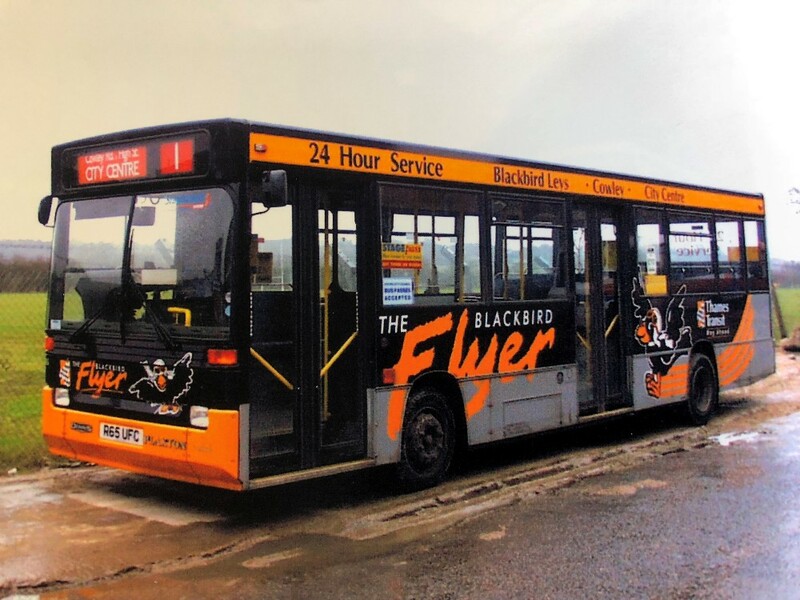 Thames Transit 3065 R65UFC during 1997 at Horspath depot displaying the then Blackbird Flyer livery. Oxford's brand new 803 R803YUD, an early ALX200, at Horspath depot during February 1998. 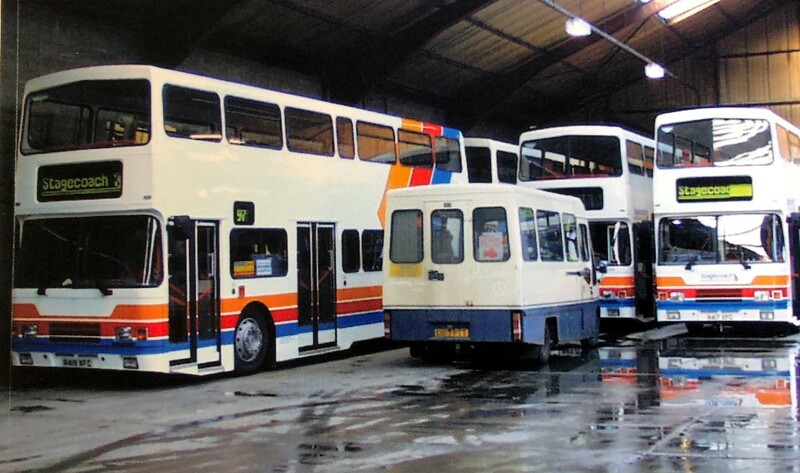 Following the acquisition by Stagecoach, Oxford's new 2 door Olympians are seen at Horspath depot after delivery in February 1998. 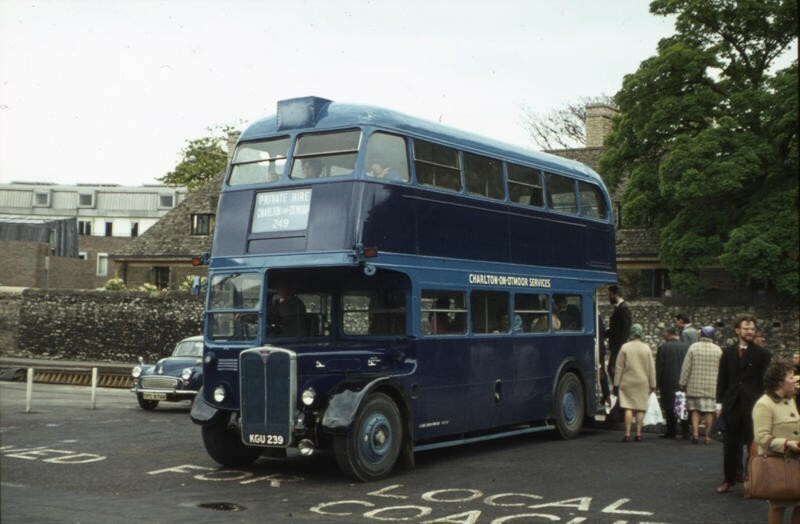 Our next meeting will be on Tuesday 15 May at 77.15 p.m. at The Tree Hotel, church Way, Iffley, Oxford, OX4 4EY when John Whitehead will speak about his new book: "Kemps and Chiltern Queens", operators with a fascinating and long history of service in south Oxfordshire. 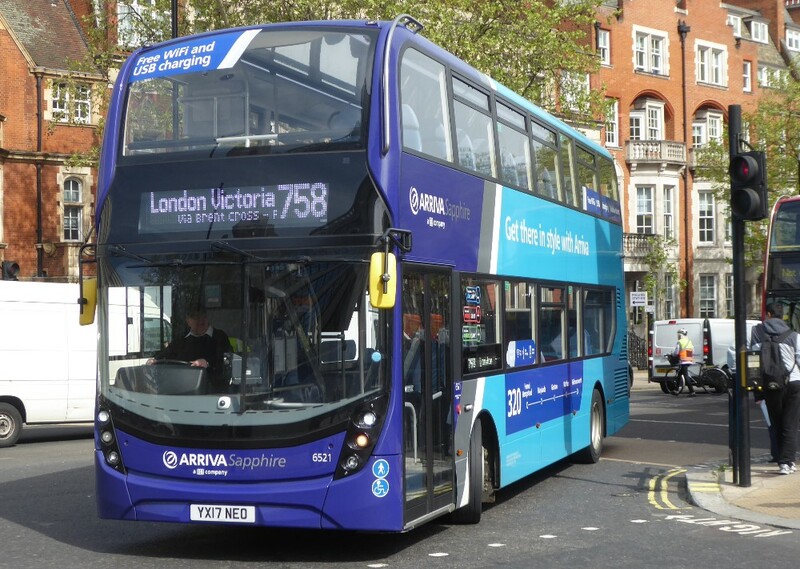 The pattern of their operations continues in much modified form today, by COMS subsidiary Thames Travel. John will bring copies of the book for sale (RRP £35). 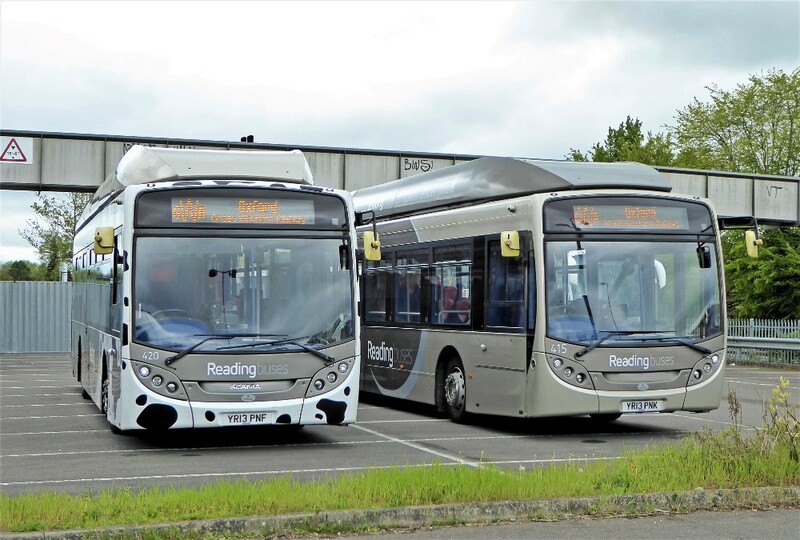 John is a very long standing member of the Reading Transport Society (now the British Trolleybus Society) and is writing a highly detailed series of histories of Reading Corporation buses, the first of which is already in print. As usual a wide range of food and drink is available at the bar before the meeting. 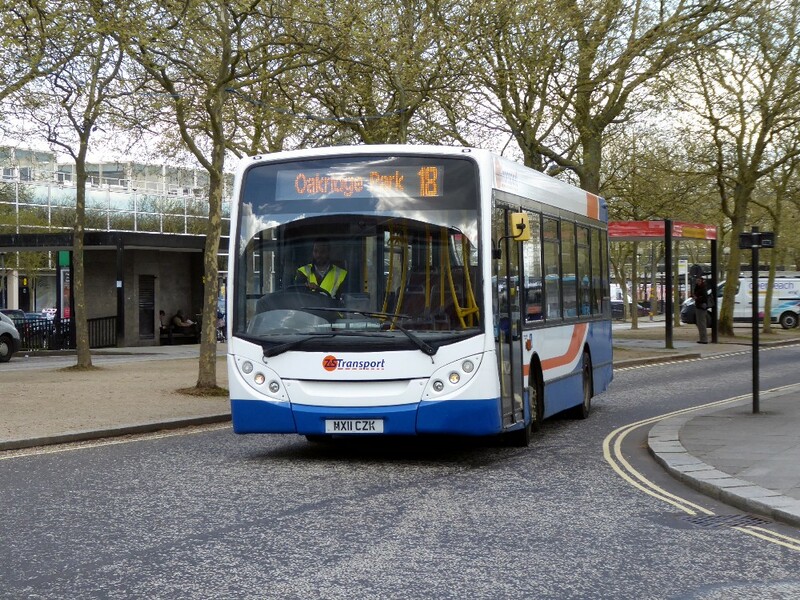 Ex London DAF 6309 works the 31 in High Wycombe on April 30th by Gavin Francis. 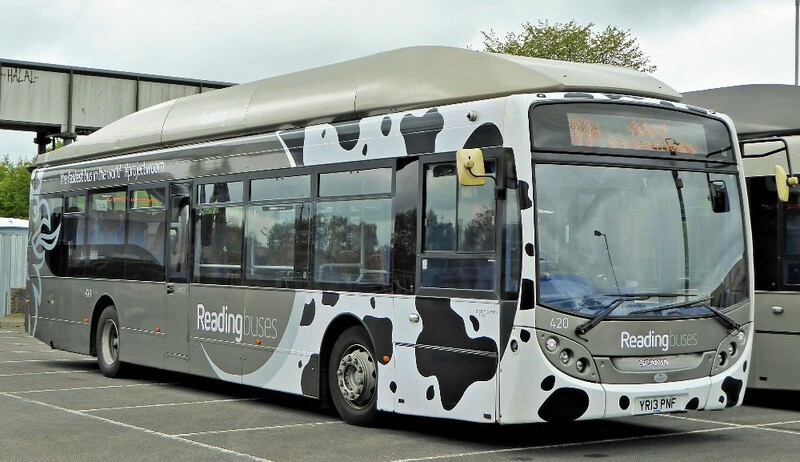 Citaro 3011 on its way to Downley or maybe Reading on April 30th by Gavin Francis. 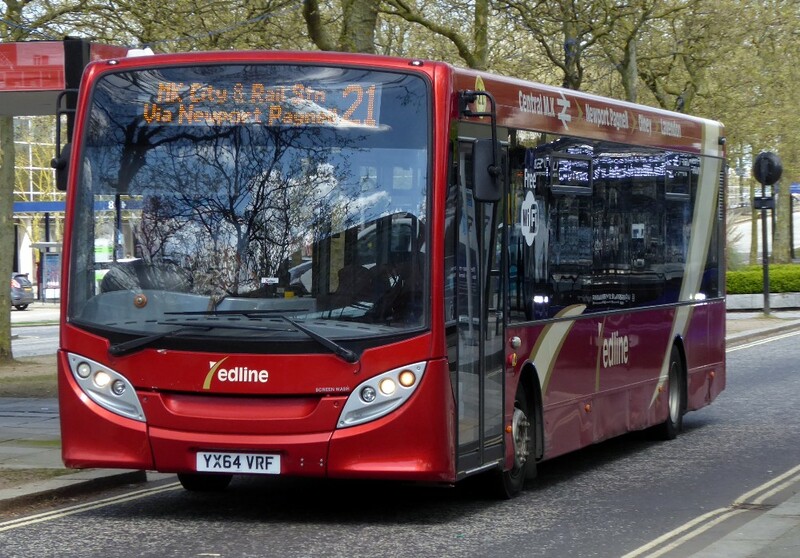 E400 MMC 6521 turning onto Elizabeth Bridge with a 758 working on May 3rd by Gavin Francis. 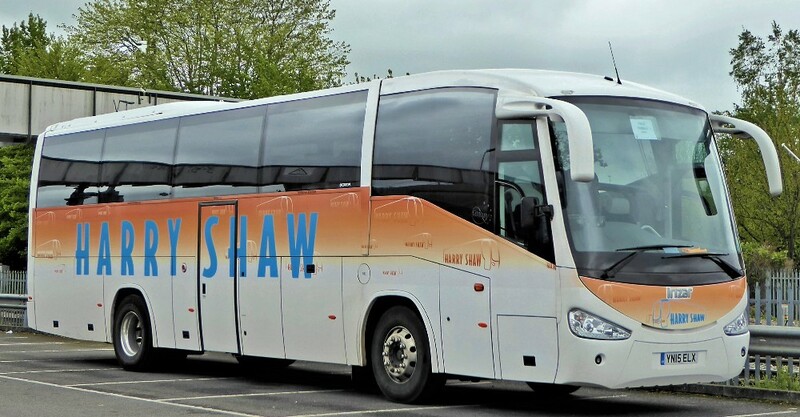 There was a Van Hool coach on this service the other day!!!! 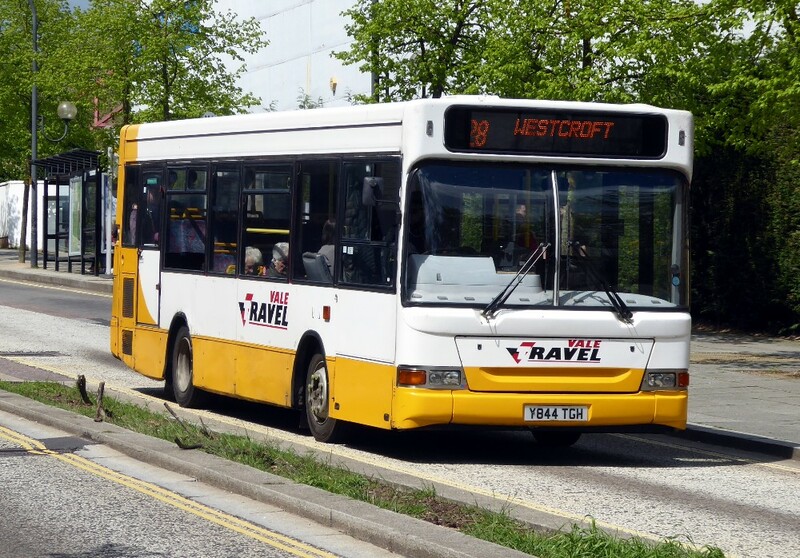 Rather late in the day (hence the quality) another off route excursion for an MMC from Hemel, 6525 on a 500 working in Aylesbury. Taken on May 2nd by Tony Bungay. Arriva Southern Counties 3741 works the 500 near Aylesbury Station on April 20th by Tony Bungay. 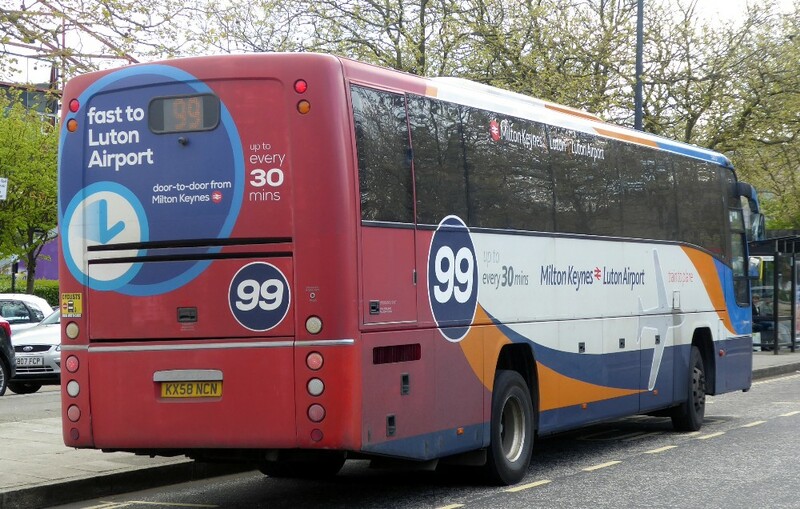 Another off branded route sighting with X8-280 3798 working the X60 to Milton Keynes on April 23rd by Tony Bungay. Finally 3797 on the 150 to Milton Keynes on May 5th by Tony Bungay. Sadly, in spite of branding, once again it is far from unusual to see branded buses on the wrong route. 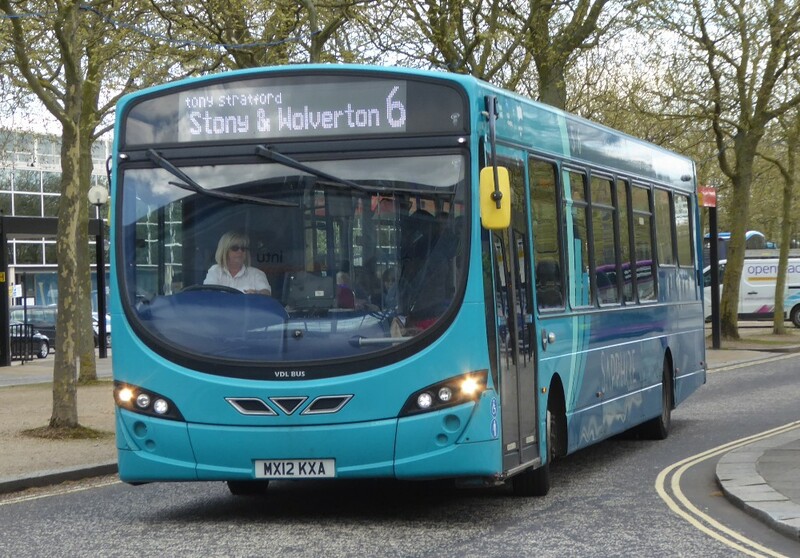 Tony Bungay writes "I note that 6524/6525/6526 have now all appeared on the 500." 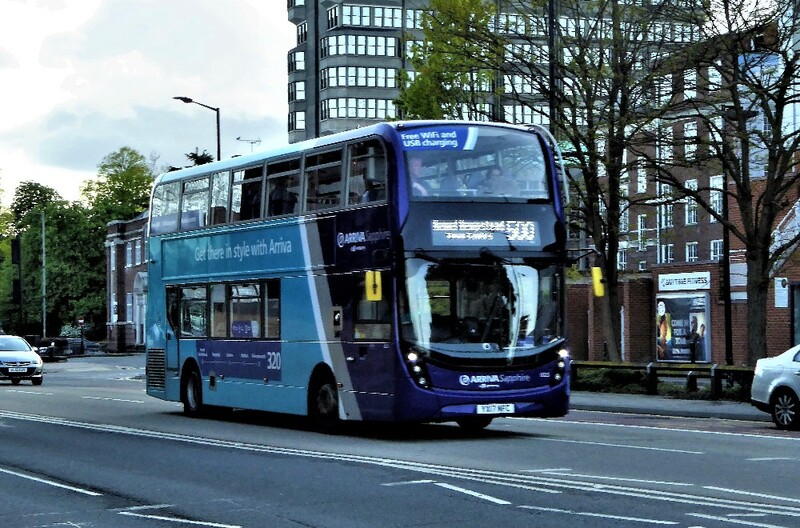 StreetLite 63314 LN65LNJ with an X74 working into High Wycombe on April 30th by Gavin Francis. 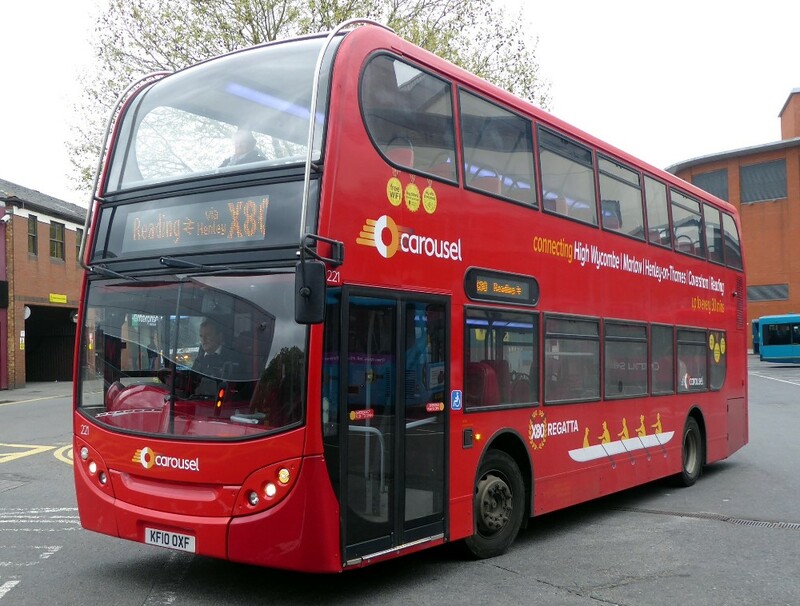 I notice that as reported in weekly briefing 9, Carousel will be renumbering service 336 as 103 from June 3rd. 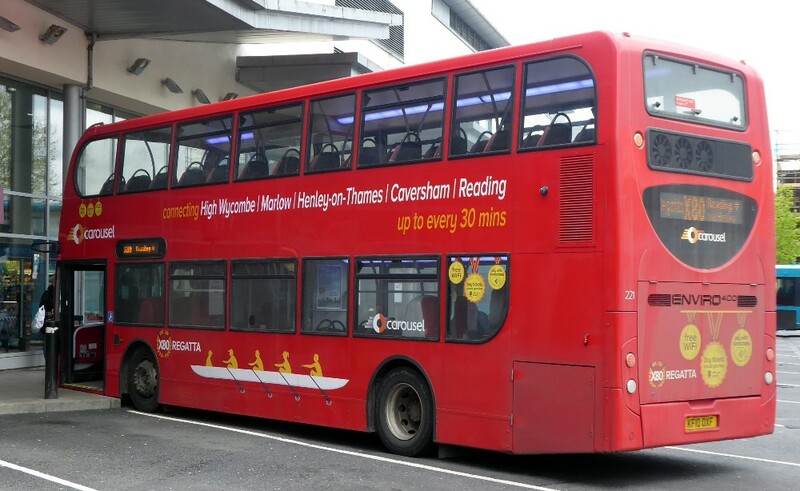 In fact the 336 number dates back to October 1934 as part of the London Transport network renumbering and the Watford – Chesham via Rickmansworth and Amersham route as service N6 was first operated in August 1921. During the London Transport era the 336 was probably best known for being the only service in Hertfordshire to be operated by the RLH type lowbridge double decker." Maybe someone can enlighten us as to why the service needs to be renumbered? For the record, with the X80 due to end, Gavin Francis took these two pictures showing the branding and destination screens of 221 on April 30th. 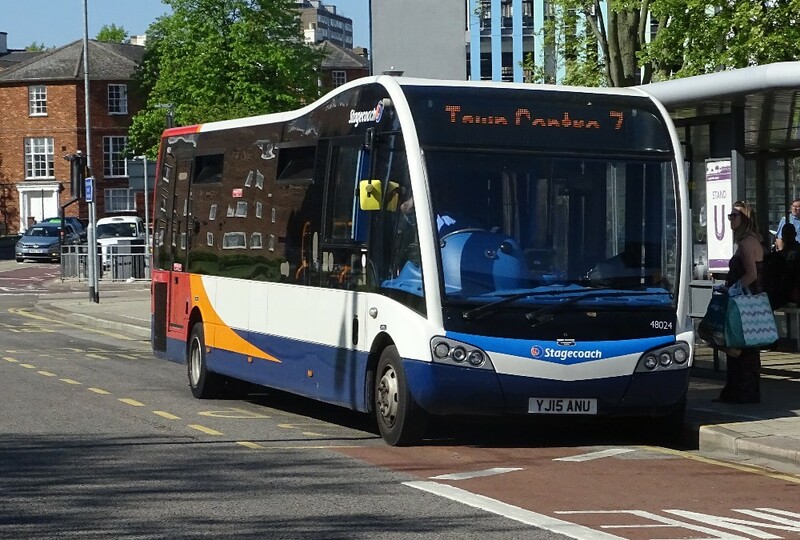 Ironically Citaro 877 was seen on the Link 40 on Sunday May 6th. City Sightseeing's 904 and 56 load at the Sainsbury's stop in St Clements on May 6th by Richard Sharman . 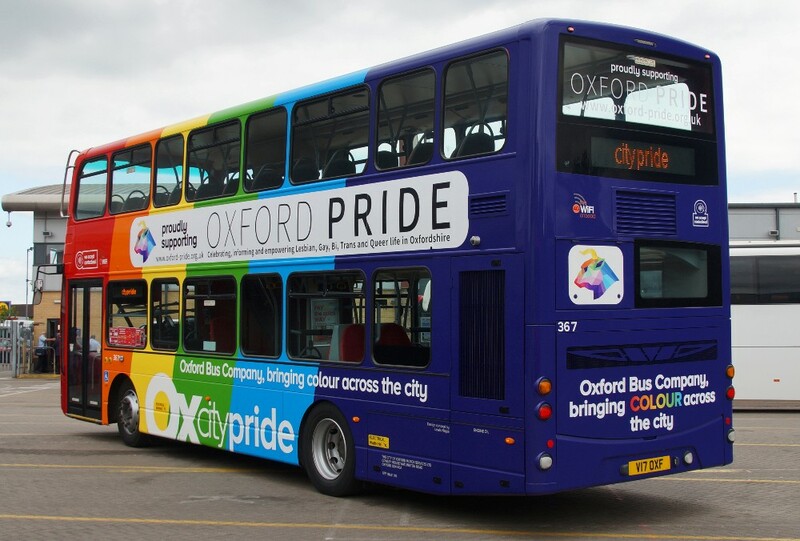 Perhaps THE news of the moment is the out shopping of Hybrid 367 in an overall wrap for Oxford Pride. 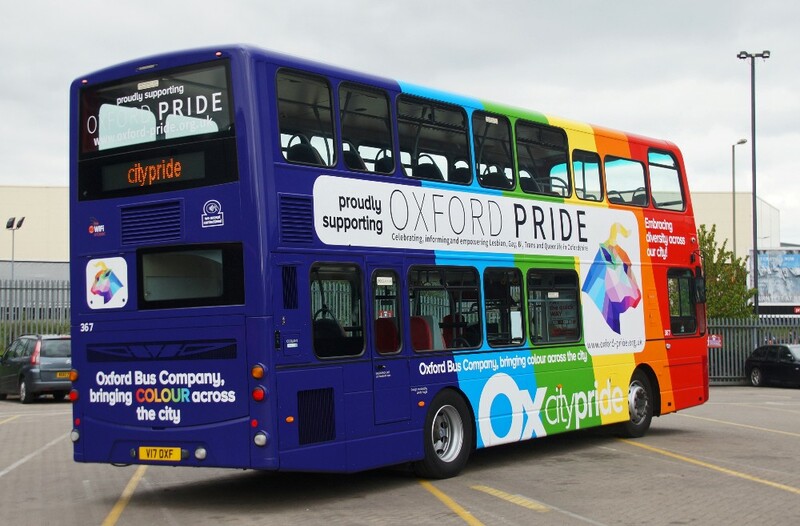 The launch took place on Friday May 4th and it is expected that this bus will take part in Pride Parade in Oxford on June 2nd. The pictures were taken by Lewis Nagle before the launch. 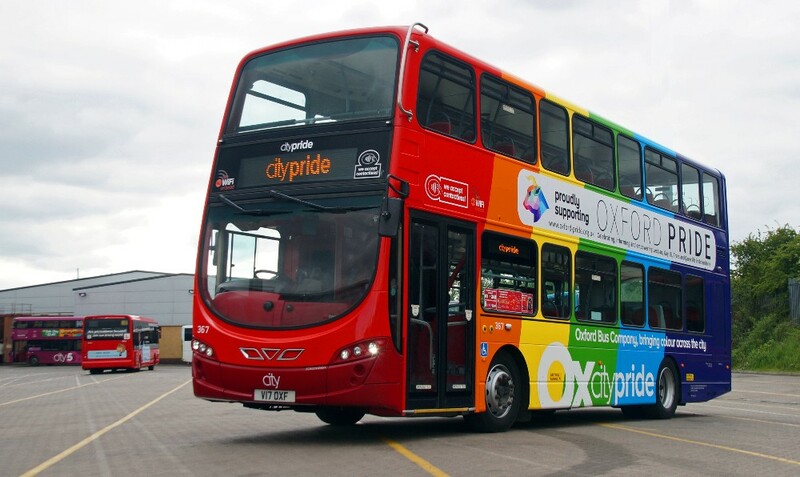 It is noted that the bus is used as a floating spare and the colours are appropriate for the diverse route branding in the City. 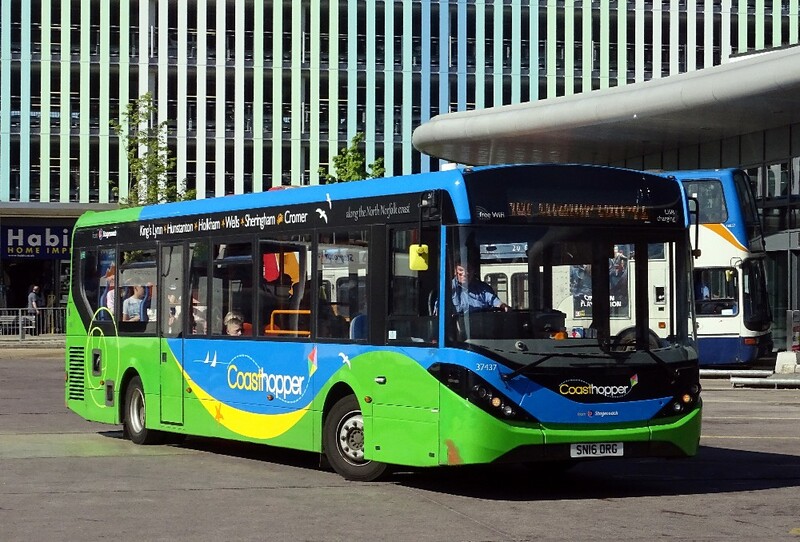 Pictures of the bus in service were provided by readers. Working X13 road on May 3rd as seen by Graham Low. And the offside rear, this time caught by Gavin Francis again on May 3rd. And so to other matters Oxford. 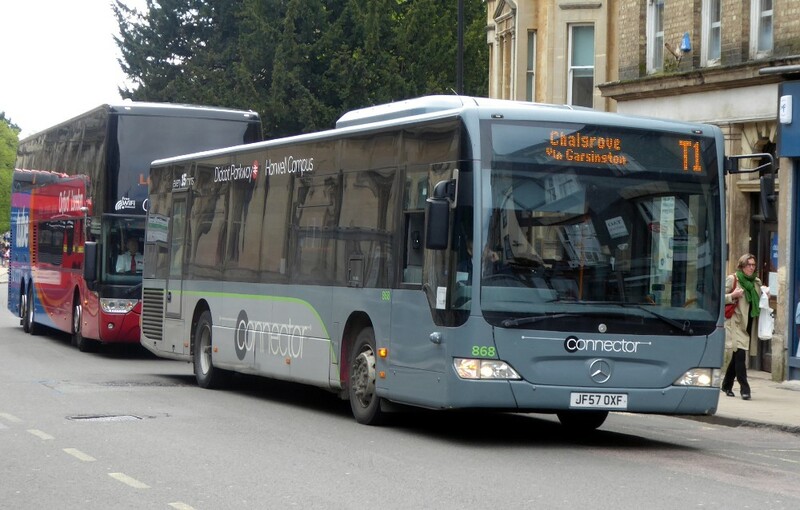 In a recent issue I posted a picture of Carousel's Citaro 878 and wondered if it was due to move to Oxford? 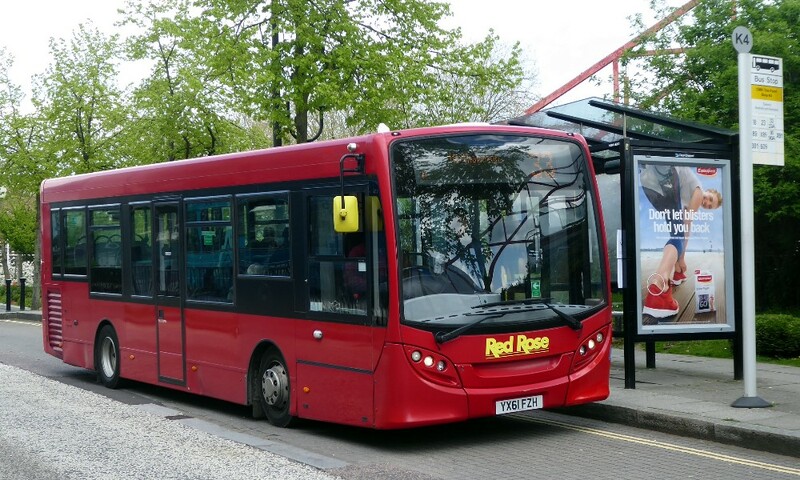 Jim Wright advises that "All red 878 was working 2 road on May 8th. it had a slip of paper in the window proclaiming the route but no other visible sign of a route display." 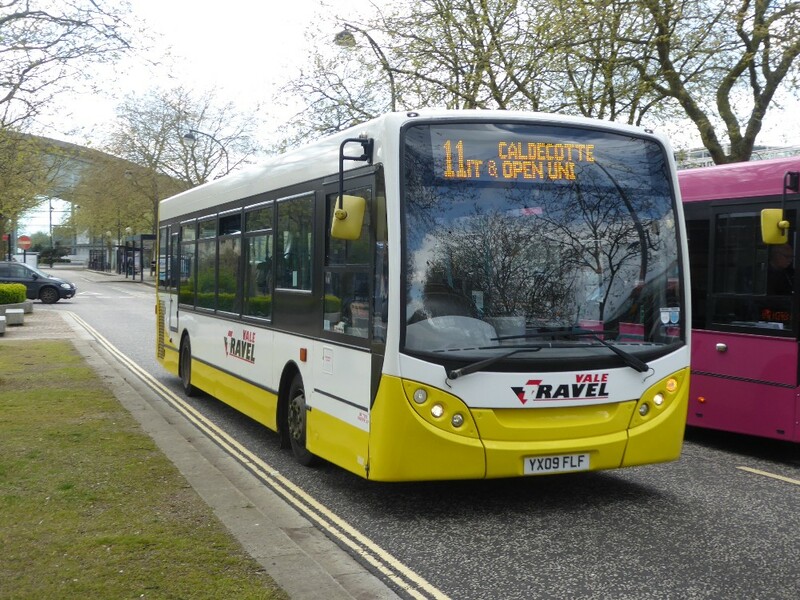 Unusually ex Park & ride Hybrid was working 5 road seen here in St Aldates on May 3rd by Gavin Francis. 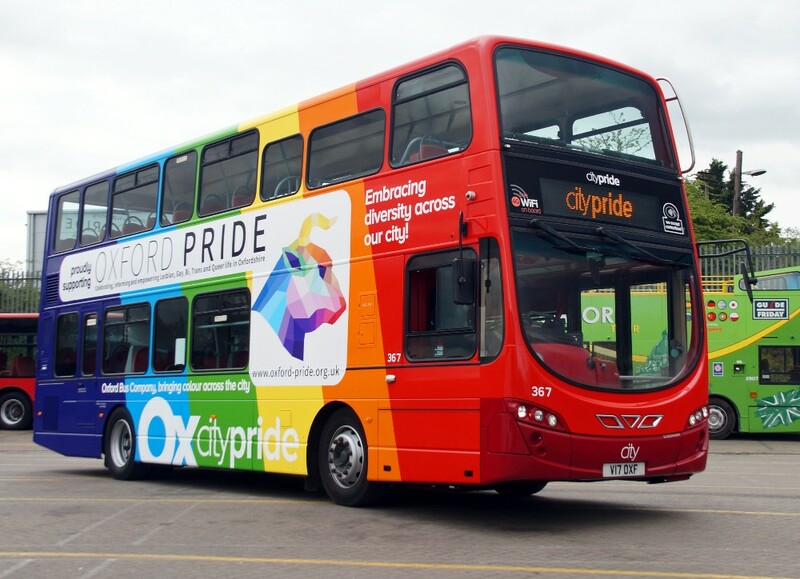 As you will see later in the page, Oxford Bus is not the only local operator to repaint Hybrid buses in fleet colours. 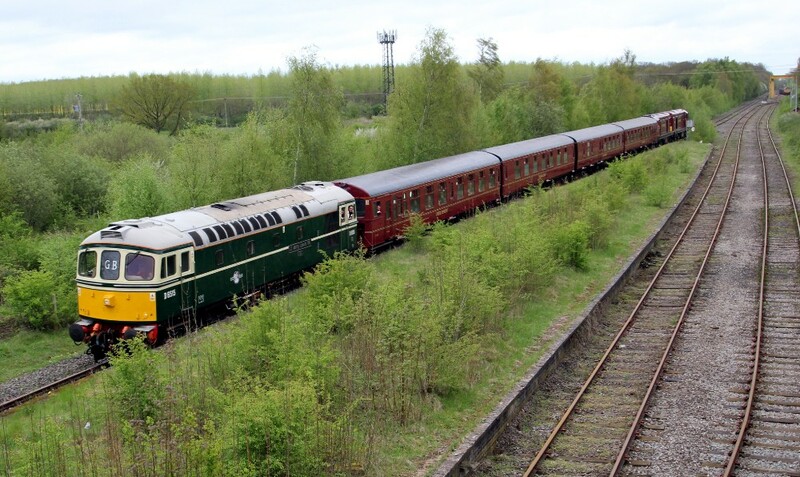 Seems 848 and 849 are being repainted in a different livery but , at press time, I have no further information. 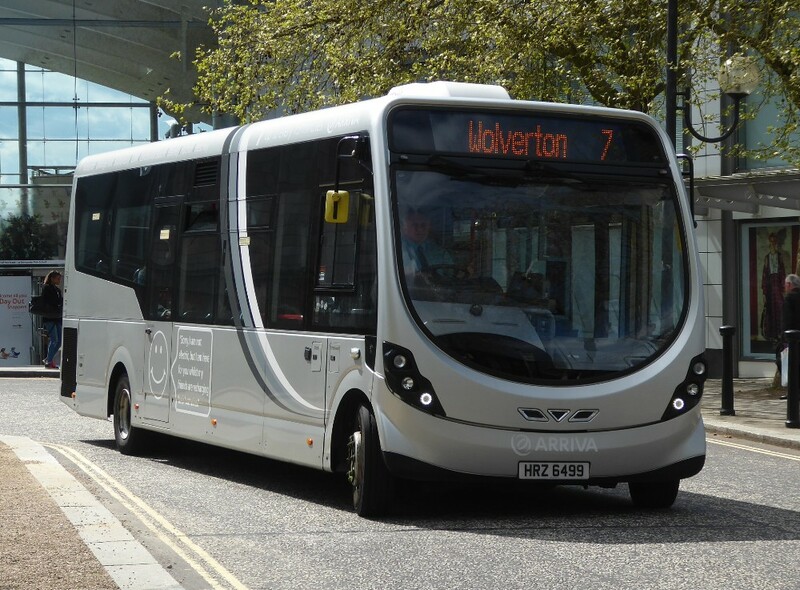 Citaro 868 works the T1 to Chalgrove when seen in St. Aldates on May 3rd by Gavin Francis. A couple of pictures this week but nothing further to report. 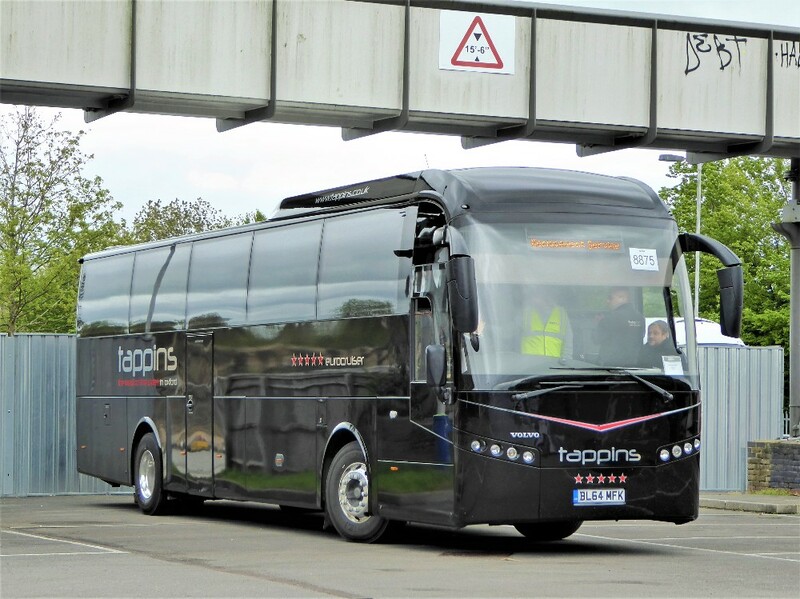 Bruce Coaches of Salsburgh's FJ14GPVworking the National Express 339 service pauses at Oxford on May 2nd by Gavin Francis. 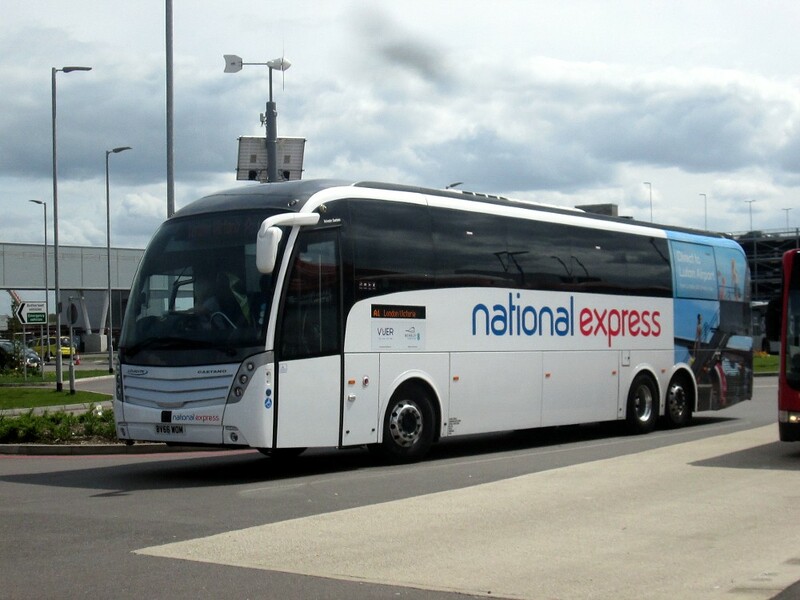 Another National Express coach with super rear branding, LA214 BV66WOM arriving at Luton Airport with an A1 from London Victoria. The picture taken by Adam Green on May 3rd. New E200 classic, YX18KOW parked up in Hemel Hempstead at the Marlow's in Croxley Park Livery on May 3rd by Adam Green. 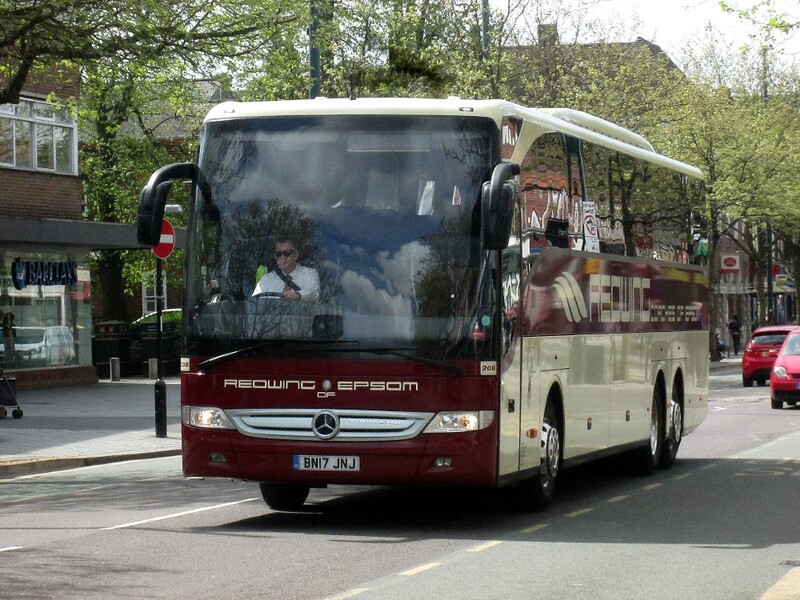 Redwing's Tourismo BV17JNJ passing through St. Albans along St. Peters Street on May 3rd by Adam Green. 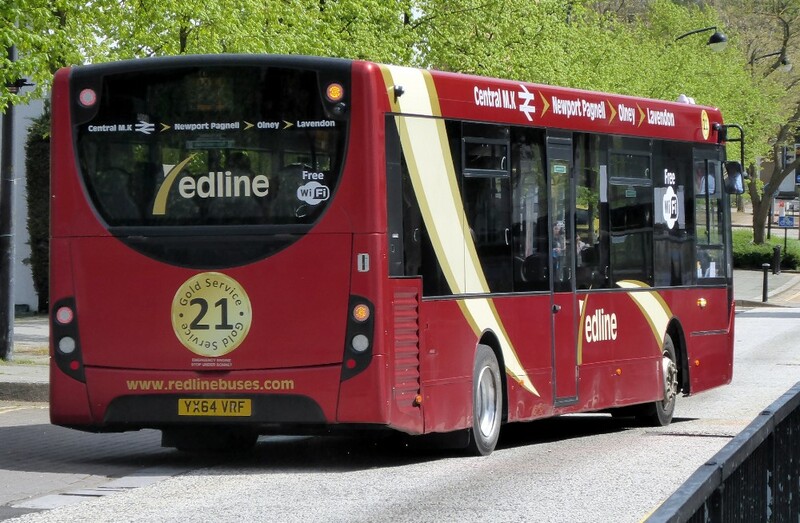 News is provided the Managing Director, Martin Sutton who advises as follows: "ADL Hybrid 12008, which has been away for repairs for several months, is about to appear in standard livery and the remaining twelve Hybrids will follow suit during the course of 2018." 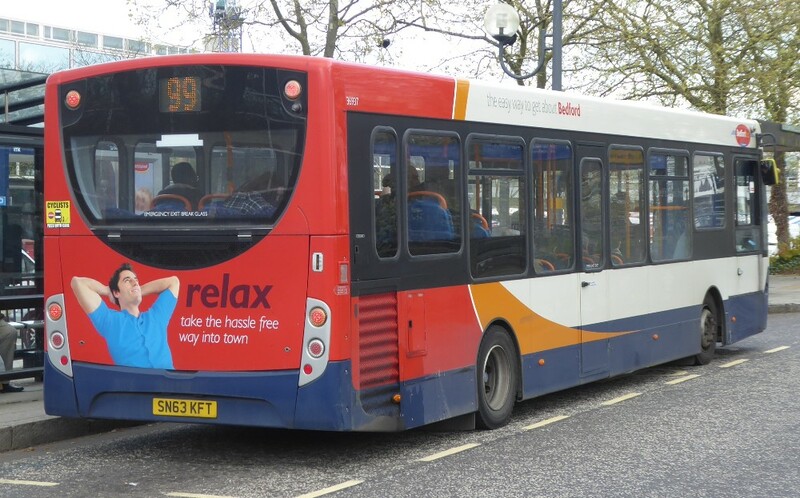 This is not the first examples of Stagecoach provincial Hybrids changing the green livery for the corporate scheme as already some inn the north East have also been repainted. 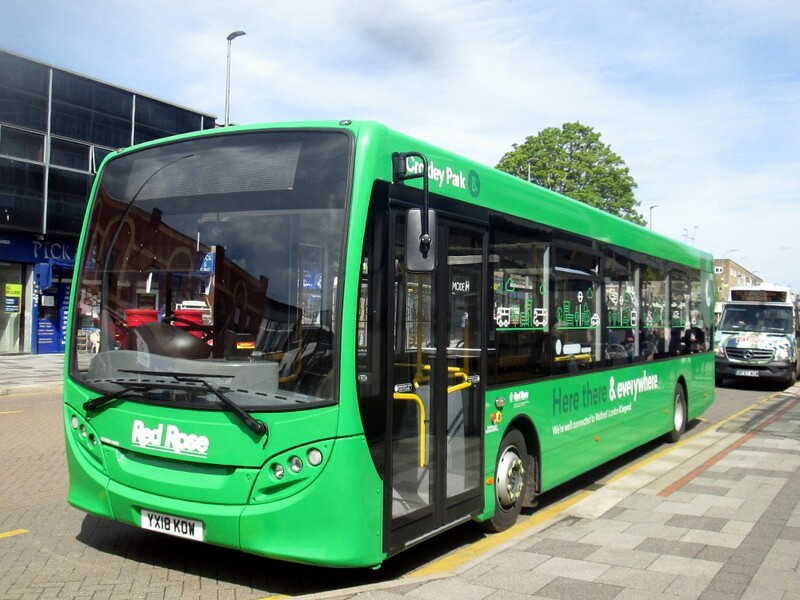 Also as mentioned above Oxford Bus have also repainted all their green ADL Hybrids. Gold MMC 10905 remains on loan at this time. Martin also advises "There are changes coming up on the Tube which will result in the PVR on the Tube reducing by two. This will put us back on track following the introduction of new Chiltern railways services." 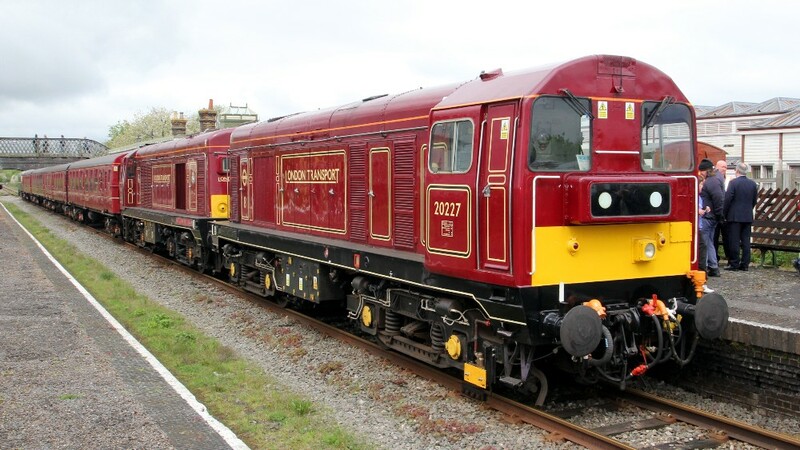 Here other sources also suggest this and have even suggested that the final two of the batch of 26, 50261-50286, will be the ones to leave. More news on these changes will be published as soon as they are known.